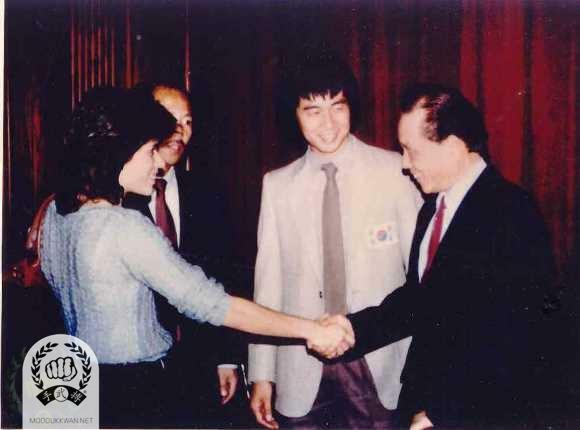 1980 July: Sponsored and participated in World Ko Dan Ja meeting in Newark , NJ. US Federation Korean instrucor's meeting at the Ramada Inn, Newark Airport. 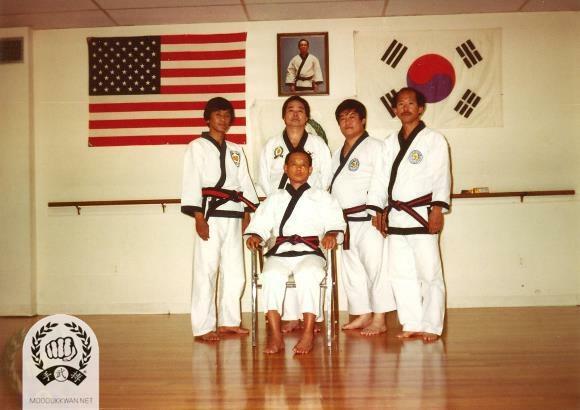 Sitting from left: Seong Ki Pak (4737), Kyung Ae Kim (14351), HC Hwang (509), CI Kim (475), TB Chung (4736). 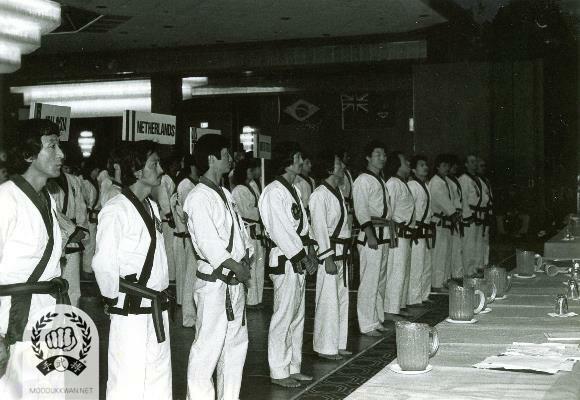 Standing from left: Kook H Cho (6963), Young Man Lee (9381), Myong Seok Seo (2322), Tong In Chang (6694), Yong Ju Lee (7575), CS Kim (2457), YK Hong (9193), In Kee Hong (16541), Wha Yong Chung (410), JS Lee (1370). 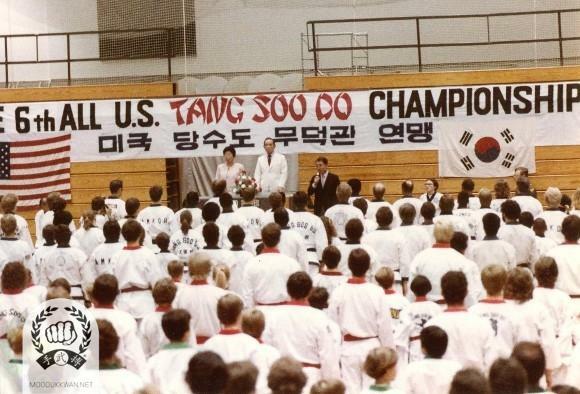 1980 December: Sponsored and organized Goodwill Soo Bahk Do Moo Duk Kwan Championships between Korea and USA held at Jang Choong Gym, Seoul. 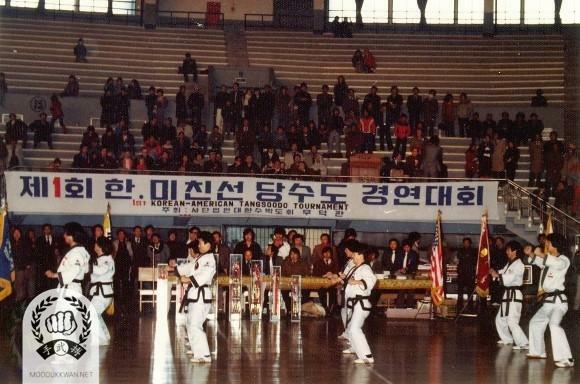 The founder's demonstration at the Goodwill Moo Do festival between Korea and USA at the Jang Choong Gym in seoul. Korea. Demonstration at the Goodwill Moo Do Festival between Korea and USA at the Jang Choong Gym in Seoul, Korea. 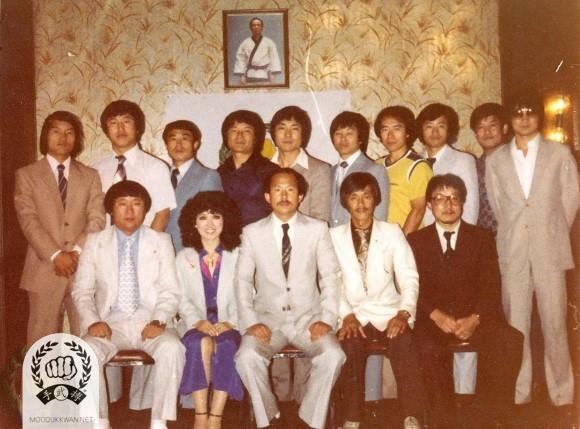 1981 September: Sponsored and participated in World Ko Dan Ja meeting, regarding 1982 World Championships in Atlantic City, NJ. One of US Federation meeting with the founder. 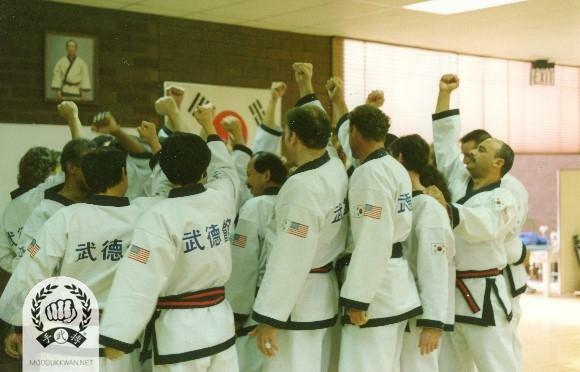 From left: Russ Hanke (4137), Andy Ah Po (10187), Tong In Chang (6694), Llyod Francis (12924), Fred Kenyon (14345), HC Hwang (509), Ted Mason (12895), CI Kim (475), Joe Goss (12191), TB Chung (4736), Arthur Pryor (16505), CS Kim (2457), Charlie Ferarro (19986), Robert Beaudoin (5661), YK Hong (9193). 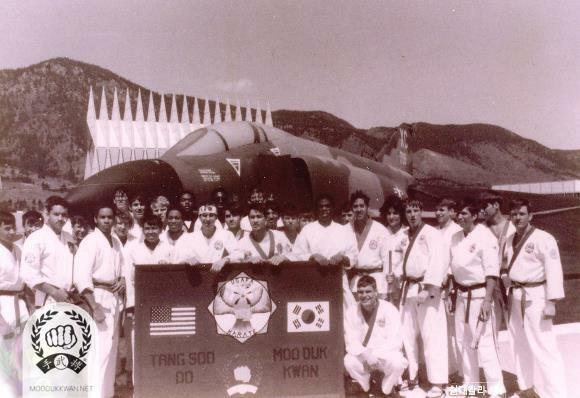 1982 May: Special Soo Bahk Do Moo Duk Kwan seminar and clinic held at U.S. Air Force Academy. 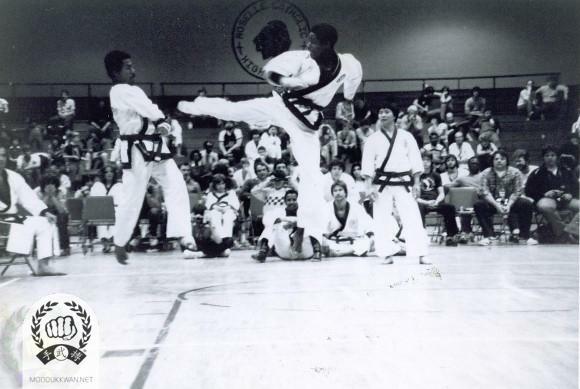 1981: 3rd United States Nationals held in Roselle Park, NJ. Goodwill team match between USA and Netherland at the 3rd US Nationals. 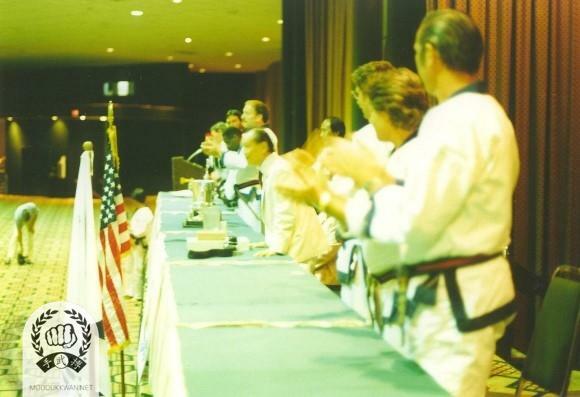 The beginning ceremony at the 3rd US Nationals in NJ, U.S.A. 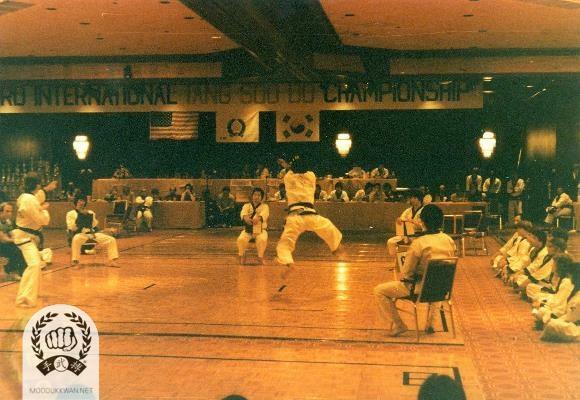 The Grand Championship match between Yeon Seo (20564) and Darrell Thomas (21424) at the 3rd US Nationals in Roselle Park, NJ. CS Kim (2457) is referring the match. 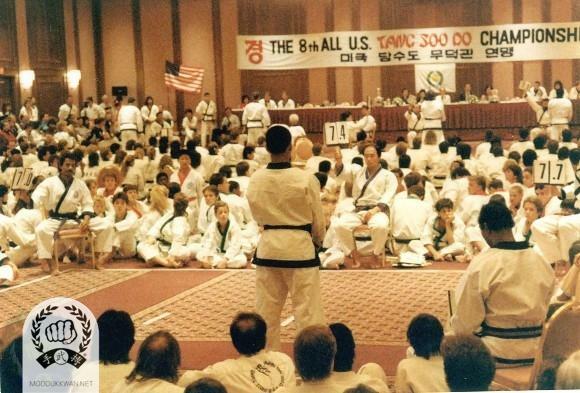 HC Hwang (509) and Young Ki Hong (9193) demonstration at the 3rd US Nationals. 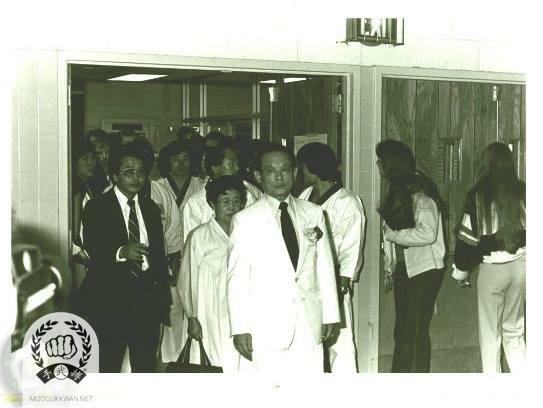 The founder and his wife's entrance to the 3rd US Nationals. Beginning ceremony of the 3rd US Nationals. Founder's entrance for the beginning ceremony at the 3rd US Nationals. Photo took atter the PA tournament with the founder and his wife. 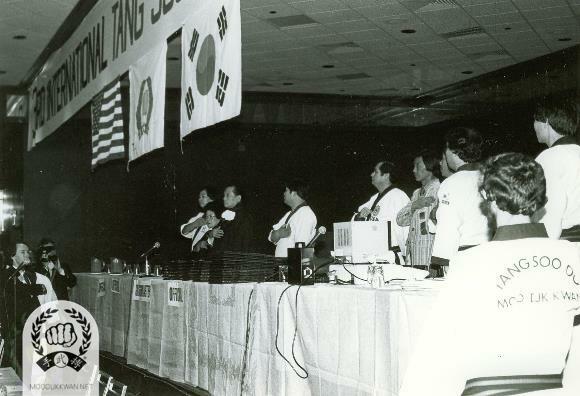 Standing from left; HC Hwang (509), Joe Margitich (15876), Darrall Thomas (21424), Yeon Seo (20564), Mary Ann Walsh (17926), Fred Tagliaferro (20624), and John Juliano (20945). 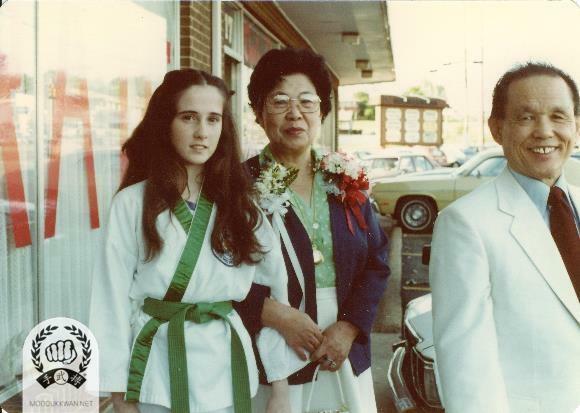 Founder and his wife's visit to Huntsville, Alabama in 1981. 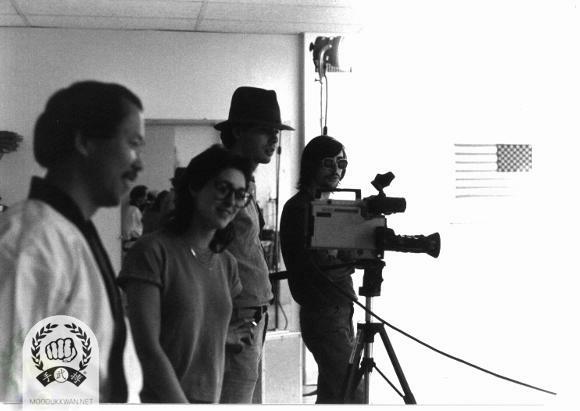 Founder's visit to member studio during 1981. 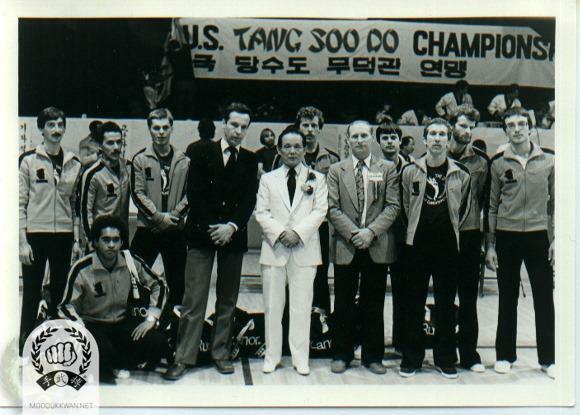 Korea and USA Goodwill tournament in Dae Jeon, Korea in May 1981. Founder, HC Hwang (509), and Hon In Lee (2163) are standing. The founder and his wife visited Oceanside, CA during 1092. Ted and Keiko Mason are seated with them. 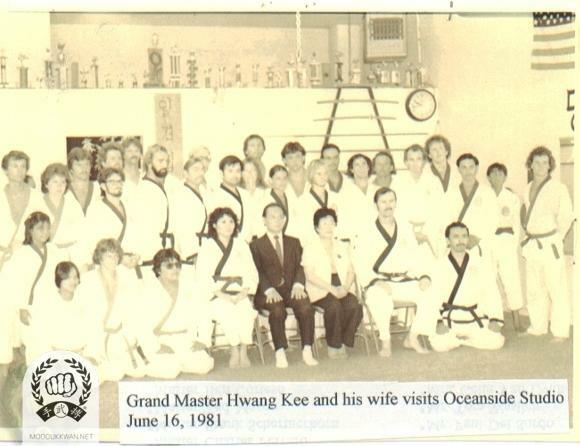 The founder's visit to Oceanside, CA during 1981. 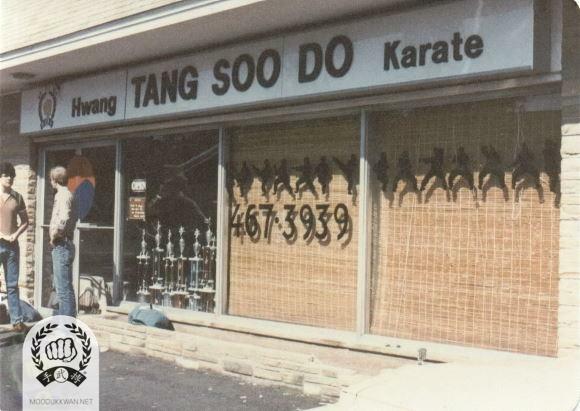 The site that used as headquarters of the U.S. Tang Soo (Soo Bahk) Do Moo Duk Kwan Federation in Springfield, NJ during 1980s. 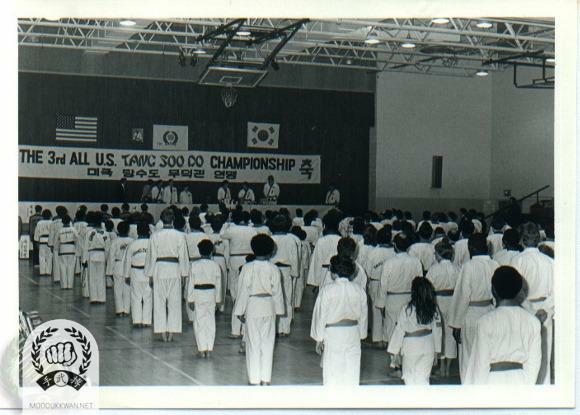 1982 November : 4th International and fourth United States National Tang Soo Do Moo Duk Kwan Championship at Atlantic City, NJ. 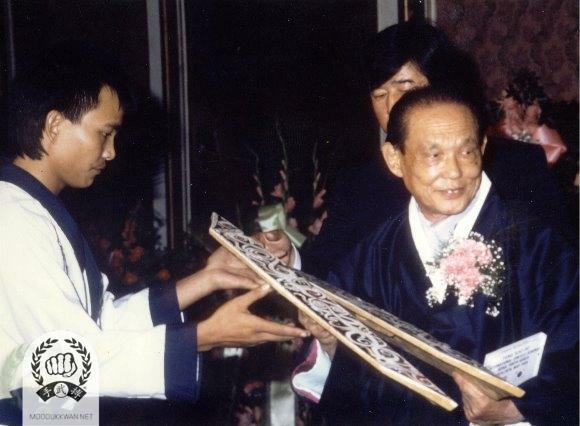 during which Hwang Kee presented the first public presentation of material translated from the Moo Yei Do Bo Tong Ji (Hwa Sun Hyung). Team match orientation at the 4th Internationals. 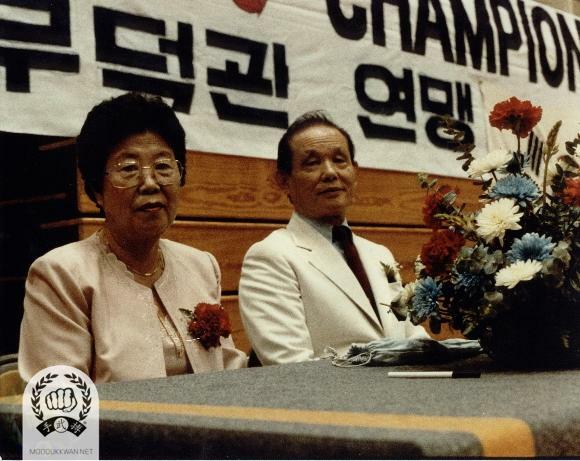 The founder and his wife at the 4th Internationals. Beginning line up at the 4th Internationals in Atlantic City, NJ. 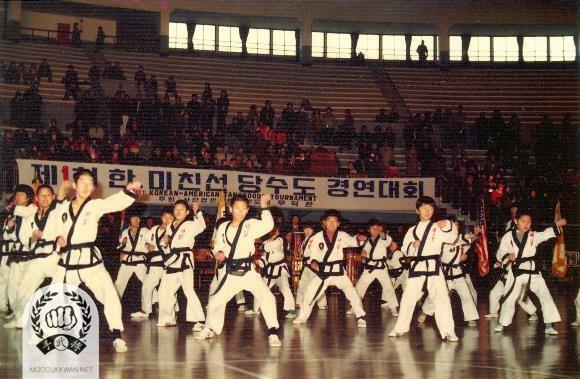 Tong Mun Kim (3167), Sung Duk Cho (8013), Hong Rae Kim (8914), Beom Ju Lee (11870) are shown in the front line. 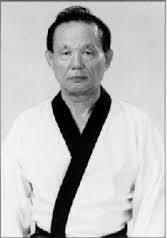 Yeon Seo (20564) is performing Jin Do Hyung at Dan Hyung contest at the 4th Internationals. 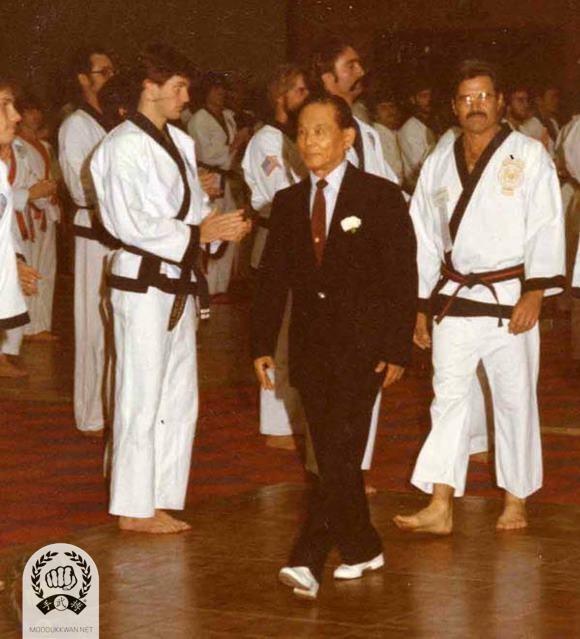 Photo made for congratulating founder's birthday from California in 1982. 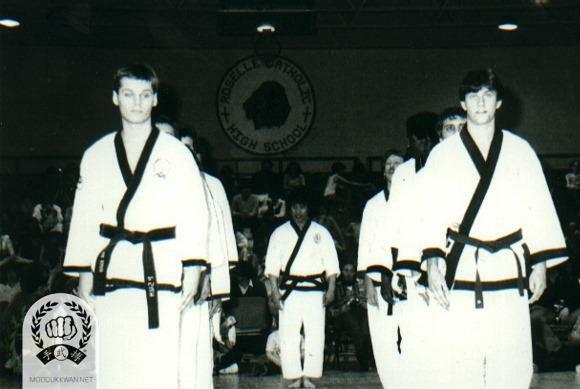 Terry Updike (18480), Scott Tannehill (18806), Vicky Updike (21465), Ronnie Updike (23117), and Trent Suzuki (23501) are in the photo. 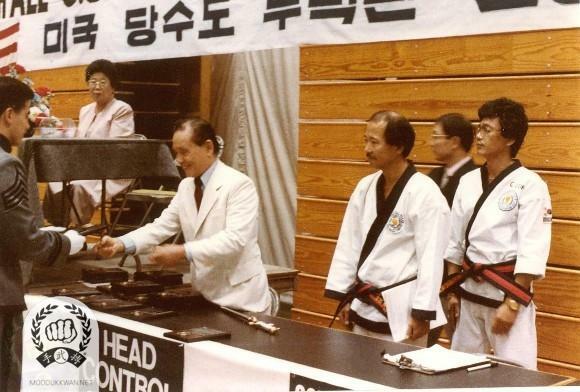 The founder's preparation for the Hwa Sun Hyung demonstration at the 4th Internationals. 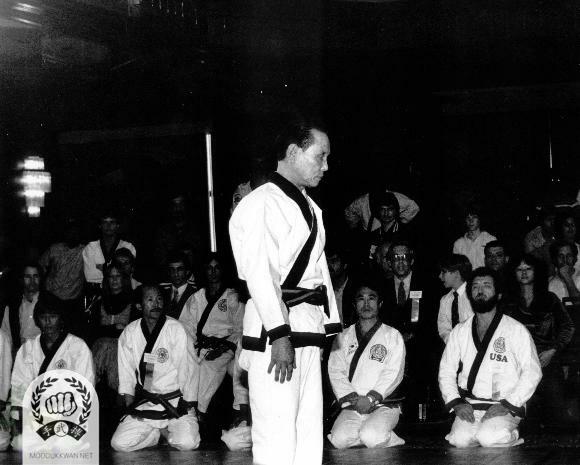 The founder's first demonstration of Hwa Sun Hyung at the 4th Internationals in Atlantic City, NJ. 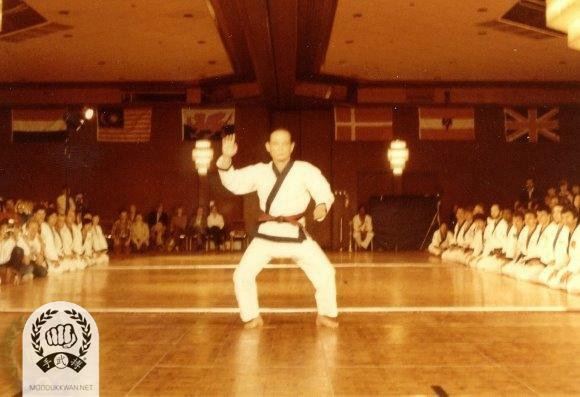 The founder's first demonstration of Hwa Sun Hyung from the Moo Yei Do Bo Tong Ji at the 4th Internationals in Atlantic city in 1982. 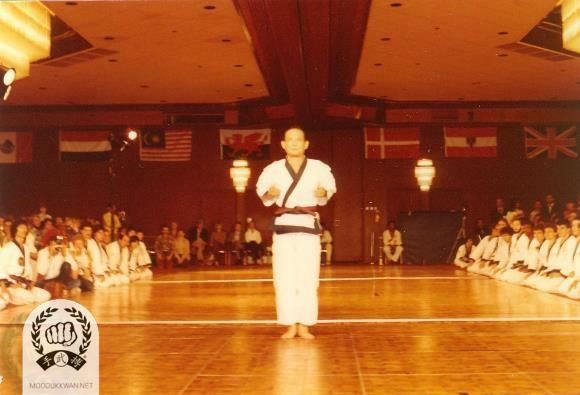 He is performing Mae Bok Seh in this photo. 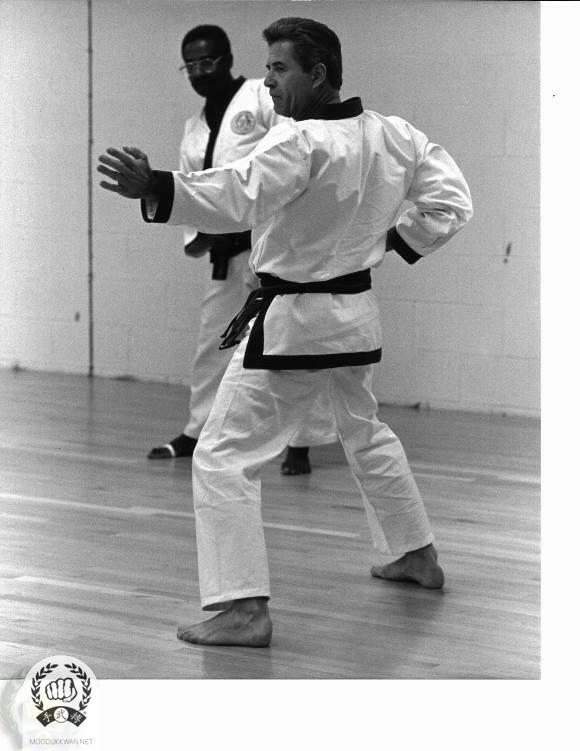 The founder's entering to the 4th Internationals. 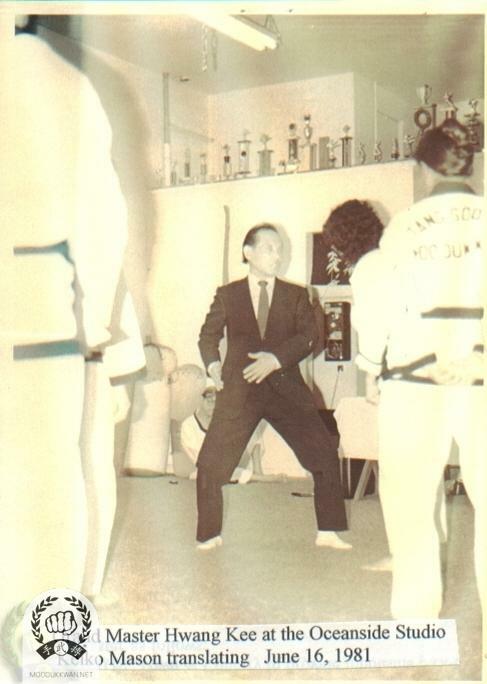 The founder's preparation for the Hwa Sun Hyung at the 4th Internationals. 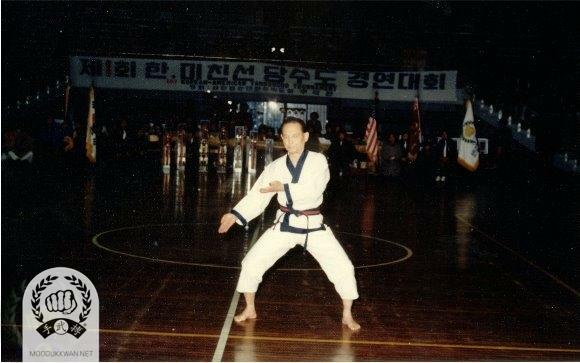 The founder is performing Do Ki Ryong Seh from the Hwa Sun Hyung at the 4th Internationals. 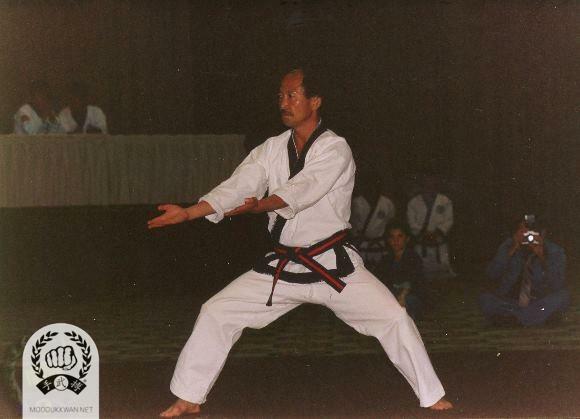 The founder is performing Tam Ma Seh from the Hwa Sun Hyung at the 4th Internationals. 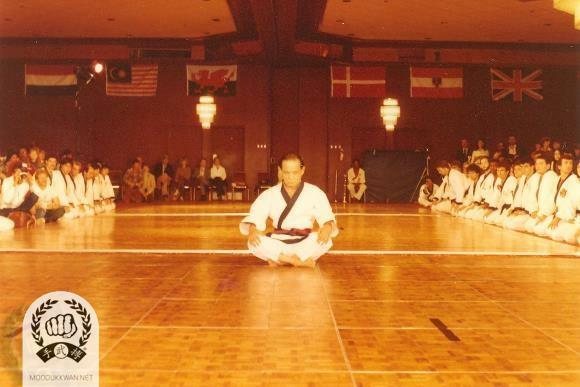 The founder's first Hwa Sun Hyung demonstration at the 4th Internationals. 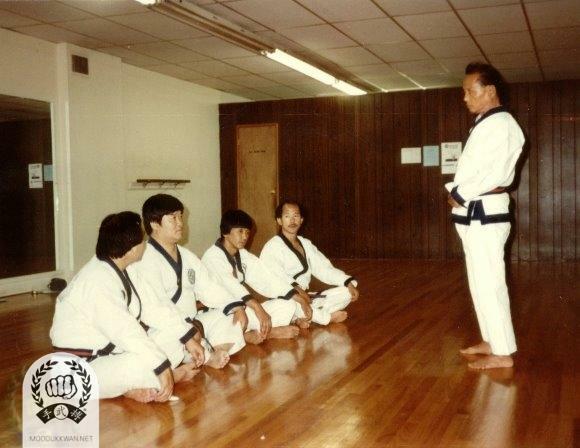 Chung Il Kim (475), HC Hwang (509), Myung Seok Seo (2322), and Russ Hanke (4137) are kneeling to observe. 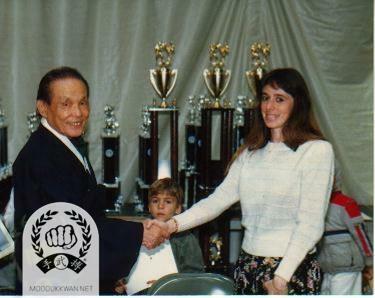 Meeting with the founder at the 4th Internationals in Atlantic City, NJ. From left: Marlene Kachevas (20786), HC Hwang (509), Dae Kyu Jang (20780), and the Founder. 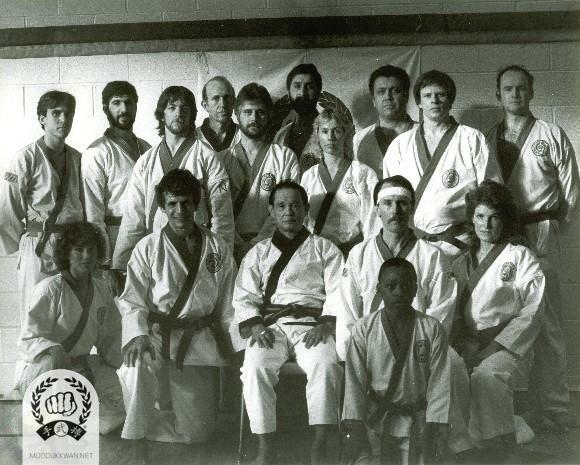 Instructors who attended for the 4th Internationals in 1982. They took a photo at in front of Founder's resident. 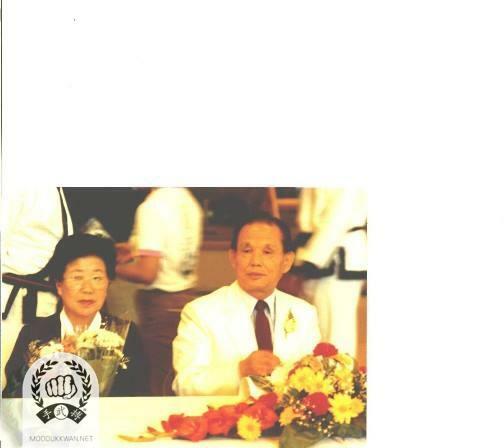 From left: Kang Uk Lee (70) and his wife from England, Beom Ju Lee (11870), Mrs. Hwang Kee, Kyong Ahn Choi (4661) from Denmark, Hong Rae Kim (8914) from Ruxemberg, The founder, Young Ki Hong from USA, Khun Hwa Lee from Greece (8321), Hyuk Yoon Kwon (10805) and Yong Jin Kim (17331) from Korea. The founder's first Chil Song Hyung clinic. 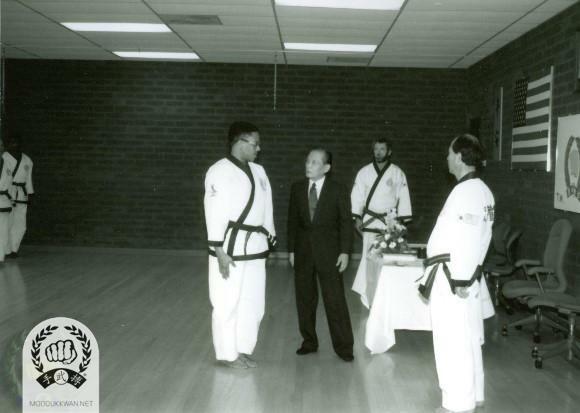 From left: Chung Il Kim (475), Kang Uk Lee (70), Wha Yong Chung (410), and HC Hwang (509) received instructions from the founder in 1982. 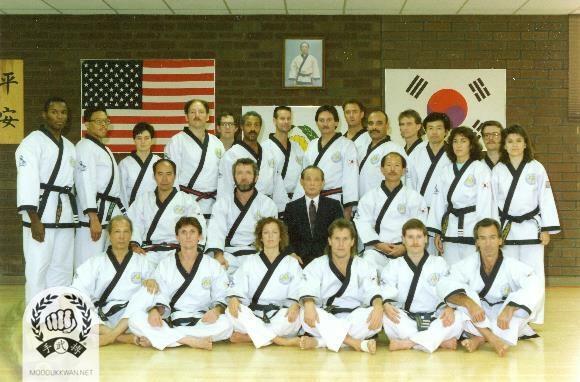 Founder's Chil Song Hyung Clinic in Springfield, NJ. USA during 1983. 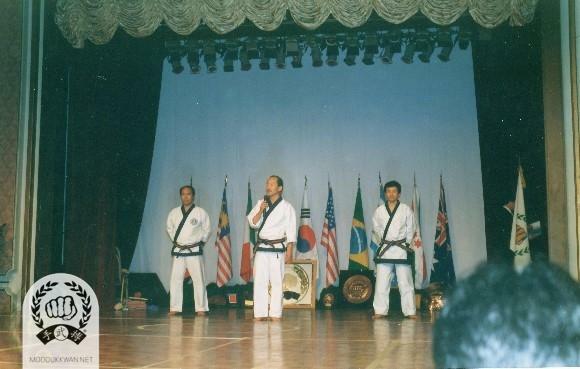 From Left; Kang Uk Lee (70), Wha Yong Chung (410), Chung Il Kim (475), and HC Hwang (509). 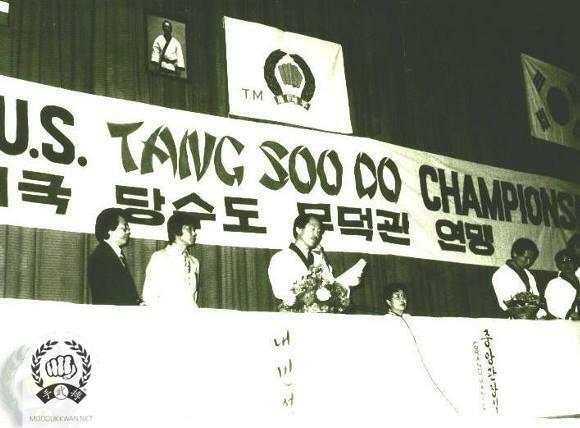 1982 December: England National Soo Bahk Do Championship. 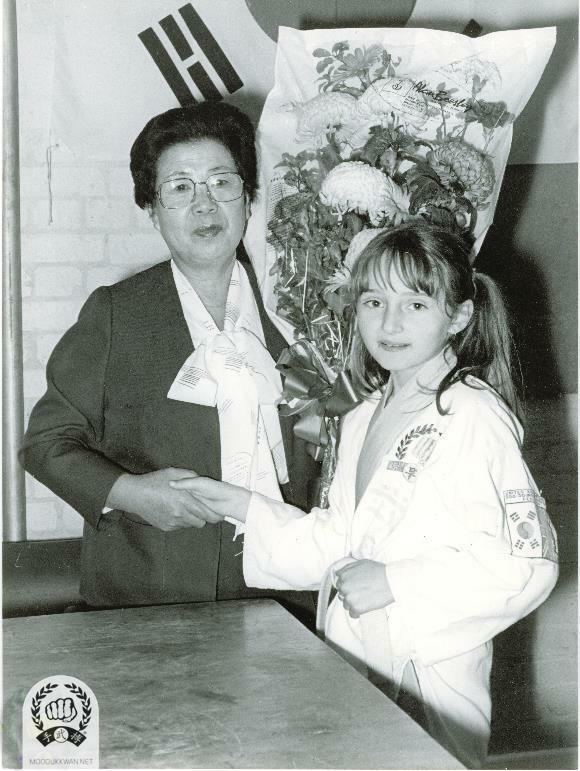 Mrs. Hwang Kee's visit to England in 1983. 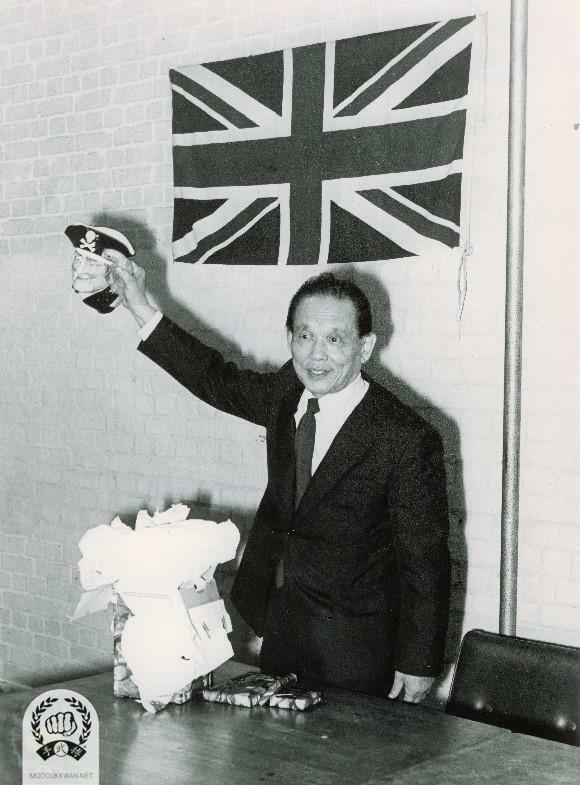 Founder's visit to England in 1983. 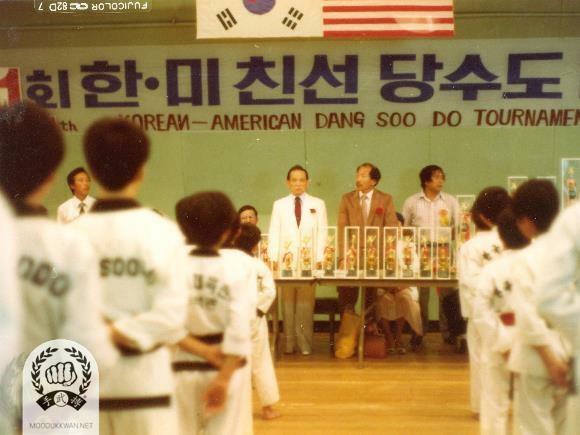 1983: August: Sponsored and organized special Chil Sung Hyung seminar and clinic. 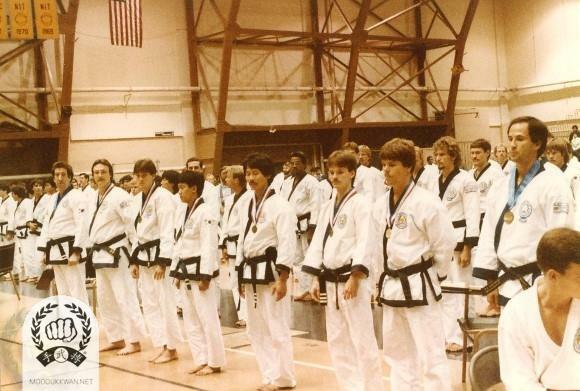 1983 November: 5th US Nationals in San Diego, California. 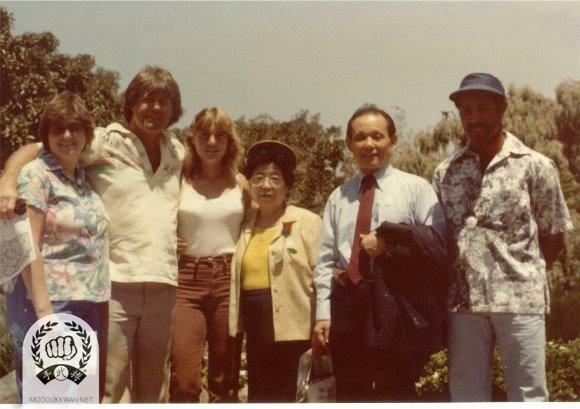 The founder and his wife's visit to San Diego in 1983. Fred Kenyon (14345) and Lloyd Francis (12924) are showing. Founder's visit to San Diego, CA druing 1983. Founder, Fred Kenyon (14345), Lloyd Francis (12924) are showing in this photo. 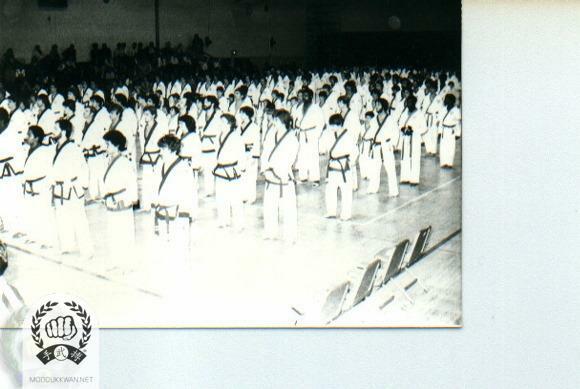 1983 December: Organized and attended the FIRST week long Ko Dan Ja testing, Springfield, NJ. 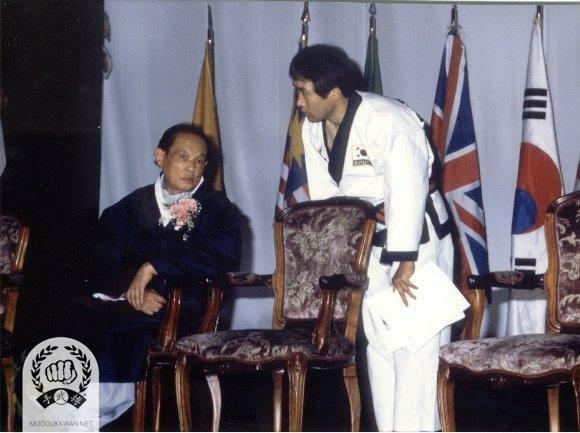 he 1st Ko Dan Ja Shim Sa in November 1983. 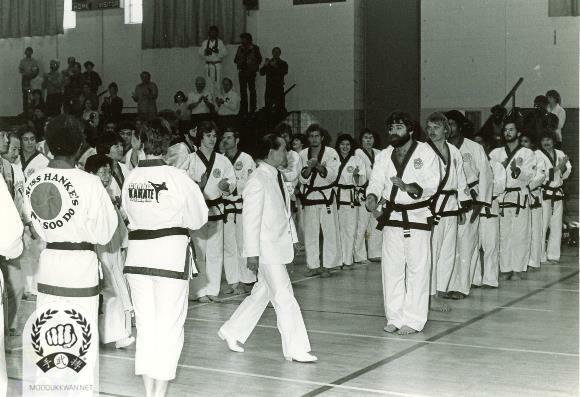 Candidates for 4th Dan were Patrick Jorgensen (18934), Daniel Nolan (19035), and Ronald Cehner (18450) and Lloyd Francis (12924) as 5th Dan candidate. 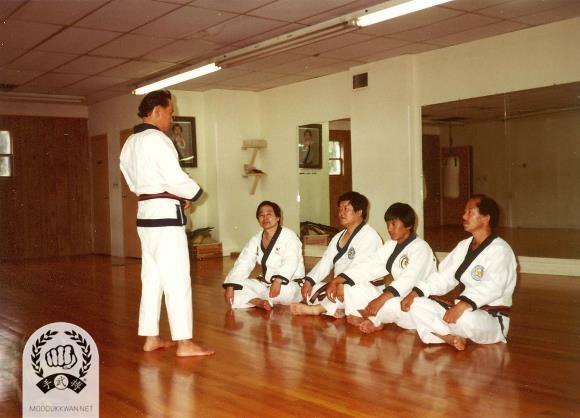 The founder's visit to the West Point Soo Bahk Do Class during 1984. 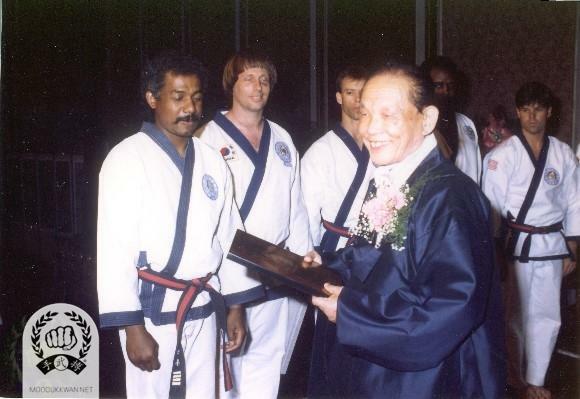 In Kee Hong (16541), Young Ki Hong (9193), Tchang Bok Chung (12641), Mrs. Hwang Kee, The founder, HC Hwang (509), Russ Hanke (4137), Mary Ann Walsh (17926), and Don Southerton (19192) are seating in front. 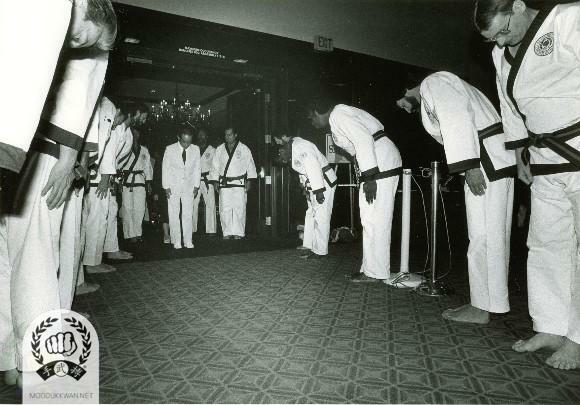 The founder's entering at the 6th US Nationals while receiving welcome by senior members. 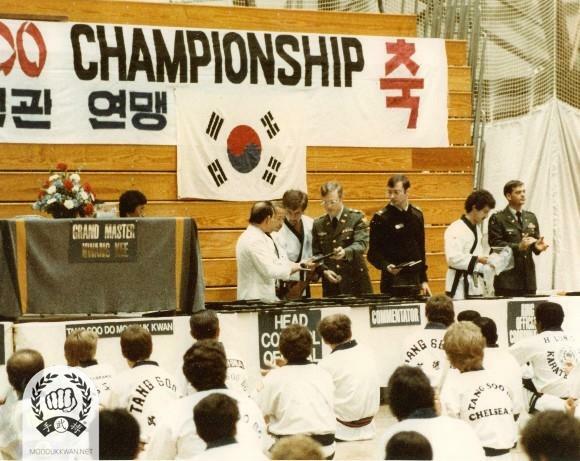 Founder present a plaque to cadet at the 6th US Nationals in West Point, NY. The founder is receiving a military knife from cadet at the 6th US Nationals in West Point, NY. CI Kim (475) is showing in this photo. HC Hwang (509) is conducting a Judge's clinic at the 6th US Nationals in West Point, NY. 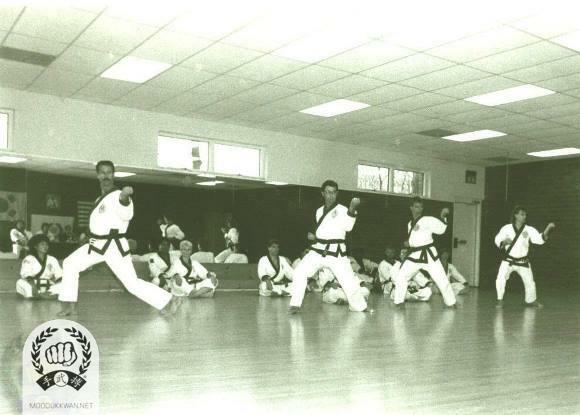 Andy Ahpo (10187), Victor Martinov (10189), Ben Cortese (11689), and Ron Cehner (18450) are showing in this photo. 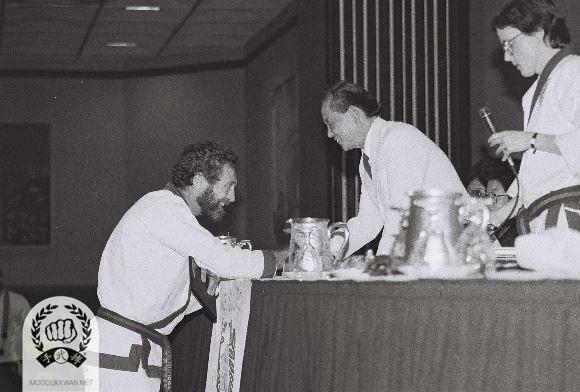 The founder at the banquet dinner for the 6th US Nationals. 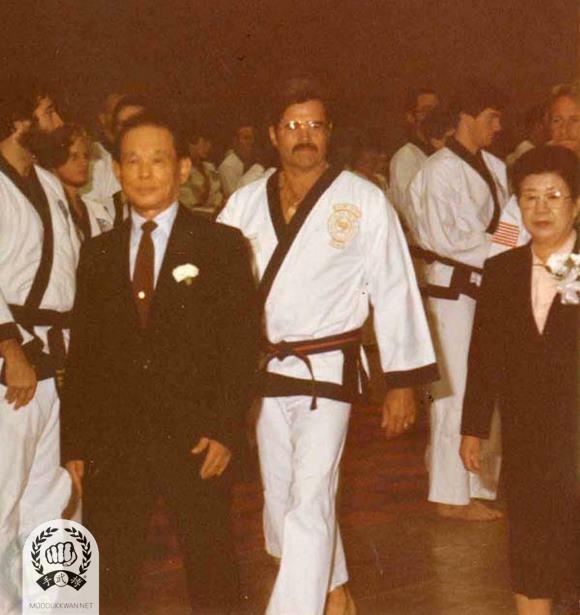 HC Hwang (509), Larry Seiberlich (1815), Don Southerton (19192) are showing in this photo. Russ Hanke (4137) is recognzing by the founder at the 6th US Nationals in West Point, NY. Mary Ann Walsh (17926) is showing in this photo. Brenda Mason (19515) at the 6th US Nationals at West Point, NY. Founder's meeting with members and their families at the 6th US Nationals. 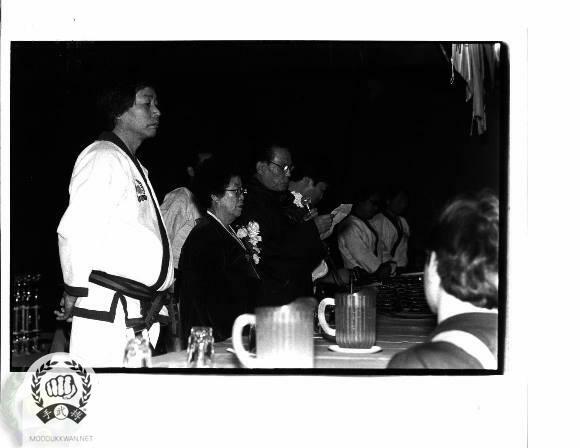 Founder's Greeting at the 6th US Nationals. Mary Ann Walsh (17926) was served as chairwoman of Board of Directors of the US Federation. 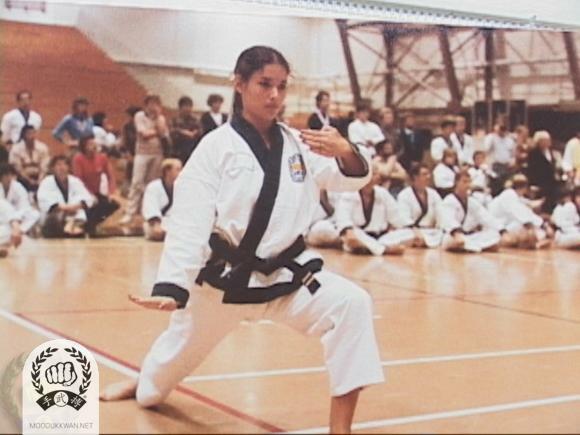 The 6th US Nationals at West Point, NY. Front line from left: Marylee Hendrick (23673), Brenda Mason (19515), Ainnie Lim (22439), and Susan Robin (19459). 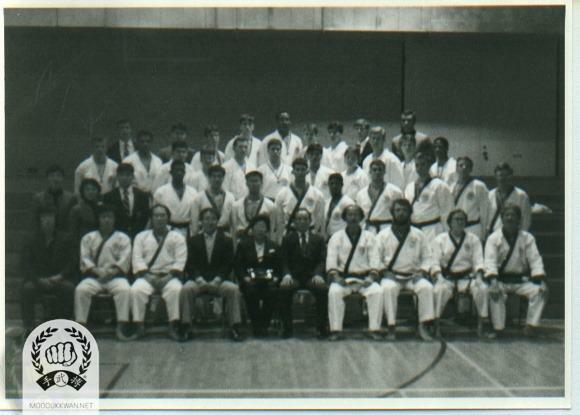 The 6th US Nationals at West Point, NY. Seen are Daymon Kenyon and Steve Diaz. 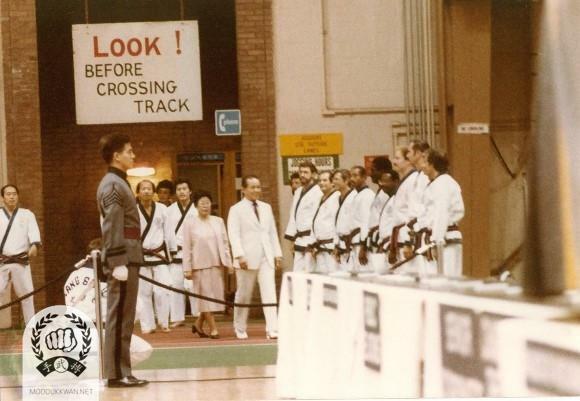 Founder with officials at beginning ceremony, the 6th US Nationals. Jeff Goodwin (20597), Alan Caponegro (22633) are showing in this photo. 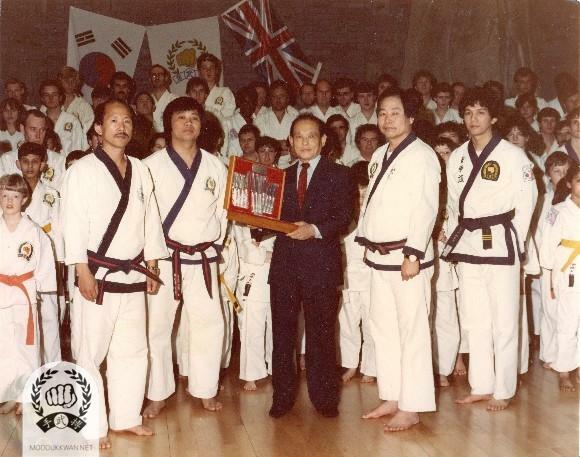 1984 November: All England National Soo Bahk Do Moo Duk Kwan Championship. 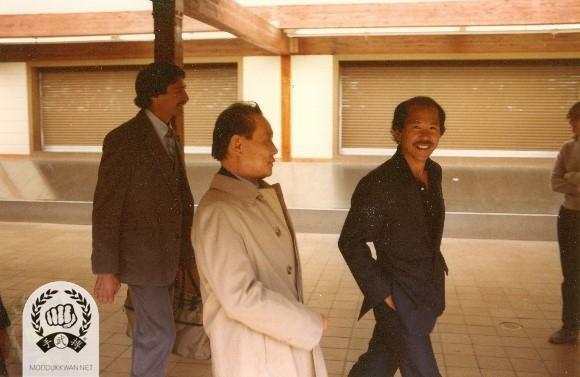 The founder and his wife's visit to England in 1984. 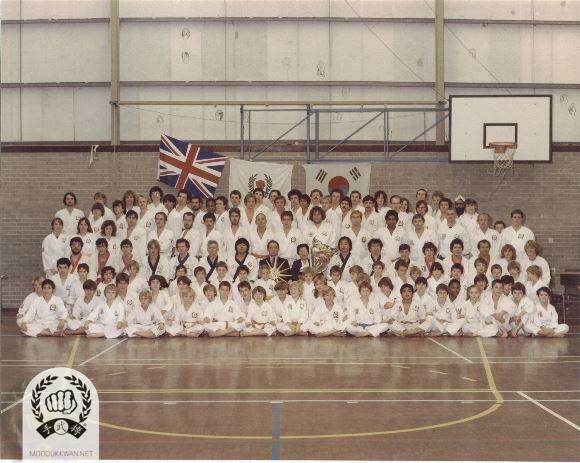 1984 November: Special Chil Sung Clinic for European region at London, England. 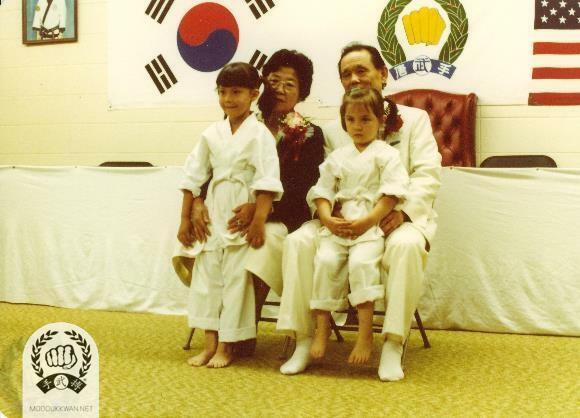 The founder's first Chil Song Hyung clinic to members at the Westfield YMCA, NJ in early 1984. Standing from left: Thomas Rocca (25023), Ken DeVos (26017), David Flick (26018), Sam Maxwell (22916), Terrance Brennan (25022), Jack Helfgott (26104), Elizabeth Kreitler (25016), John DiFiore (23709), William Weber (23641), Unknown. Seating from left: April Pampalone (26929), Nelson Abanto , Founder, Ed Faherty, Jamal Wright (25020), and Gloria Ruby (26456). 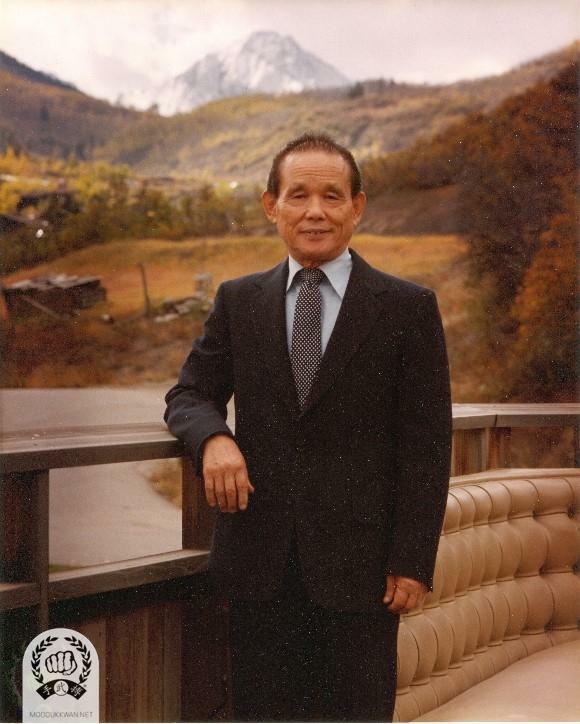 The founder during his visit to Aspen, CO in 1984. Founder's visit to Aspen, CO for Chil Song Hyung Clinic. Jeff Moonitz (17650), Founder, and HC Hwang (509) at the Aspen Airport. 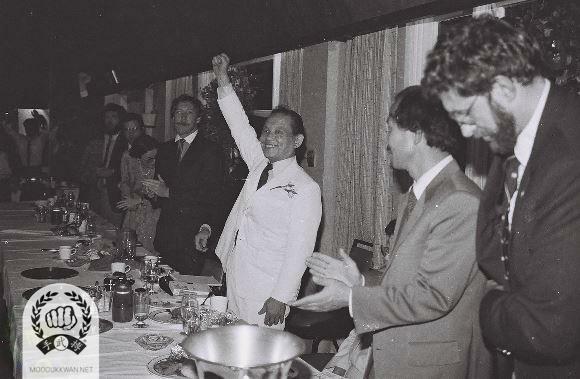 The 2nd Week long Ko Dan Ja Shim Sa in 1984. 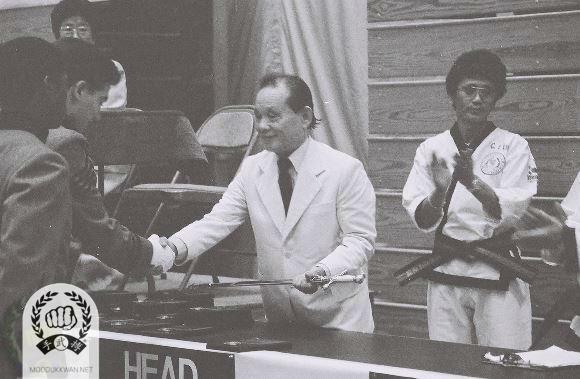 From left: L Seiberlich(1815) for 6th Dan candidate, B. Cortese(11689) for 5th Dan candidate, J Moonitz(17650), and F Scott(19187) are for 4th Dan candidates 9n 1984. 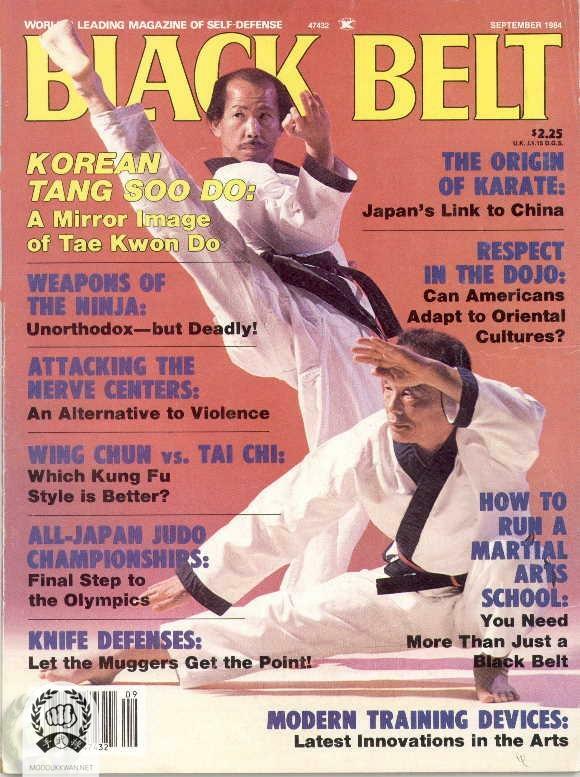 September 1984: Founder and H.C. Hwang, current Kwan Jang Nim, are featured on the cover of Black Belt Magazine. 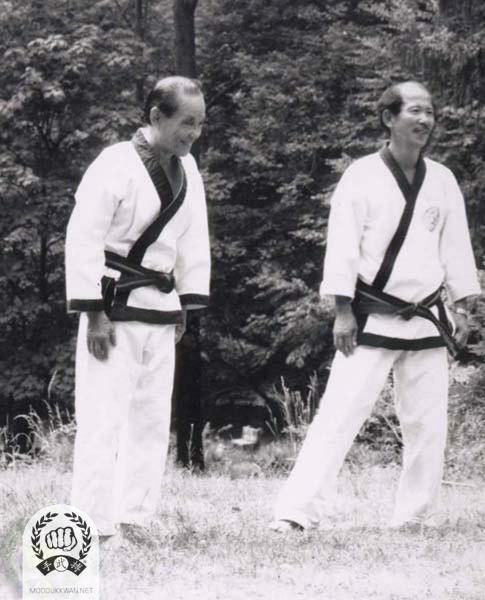 The founder and HC Hwang are covered on September 1984 Black Belt Magazine. 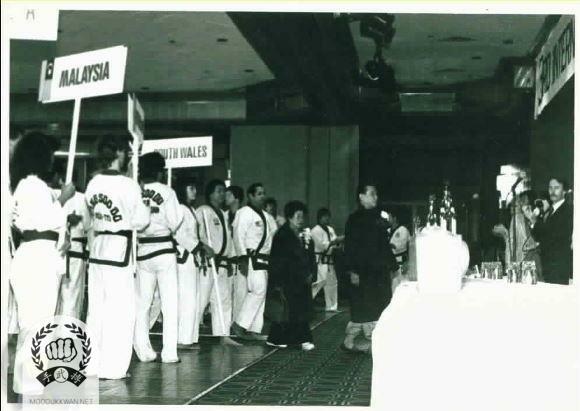 1985 March: Attended special Chil Sung Clinic for the South East Asia region at Sarawak, Malaysia. 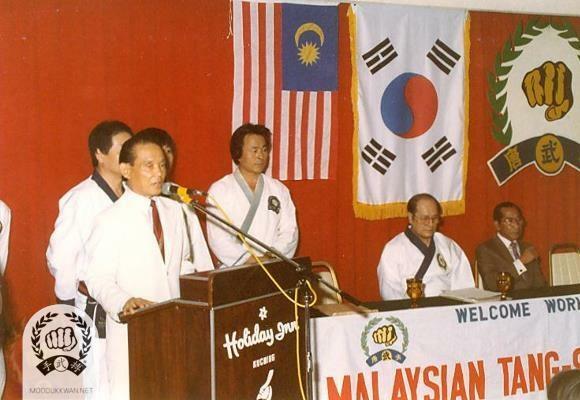 The founder's visit to Malaysia in 1985. 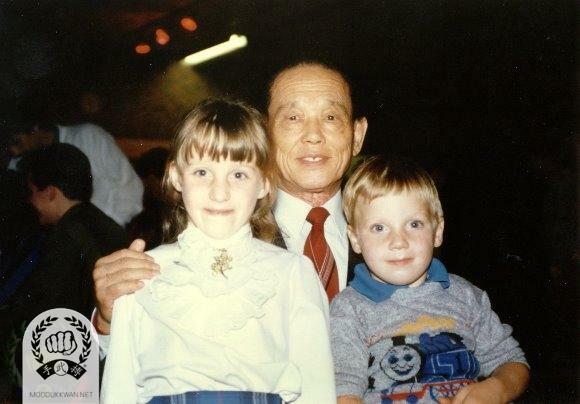 1985 Chil Song Hyung and Moo Pal Dan Khum clinic by the founder in England. 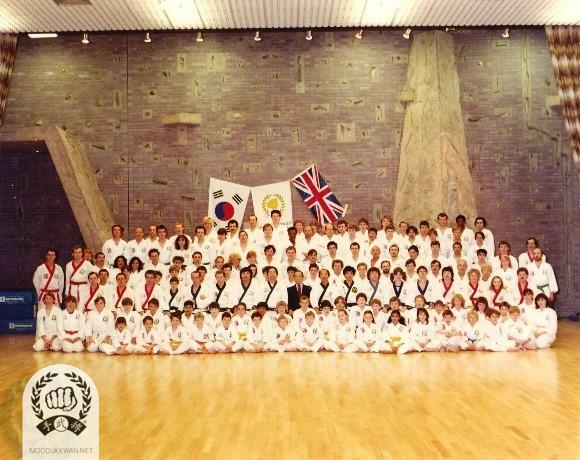 The founder, Kang Uk Lee (70), HC Hwang (509), Louis Loke (23436), Peter Chin (19982) ar showing in this photo along with students of Moo Duk Kwan in England. Chil Song Clinic in England. 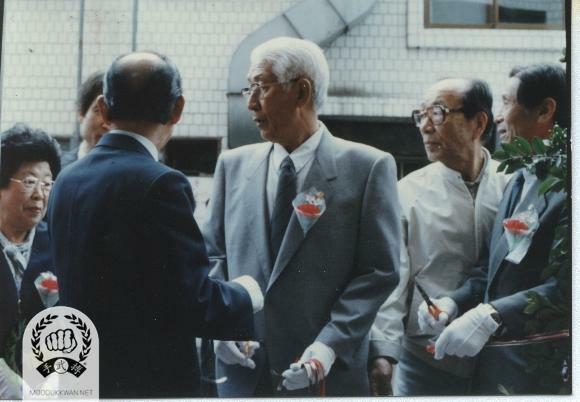 From left: HC Hwang (509), L. Loke(23436), KJN, KU Lee(70), and P. Chin(19982). 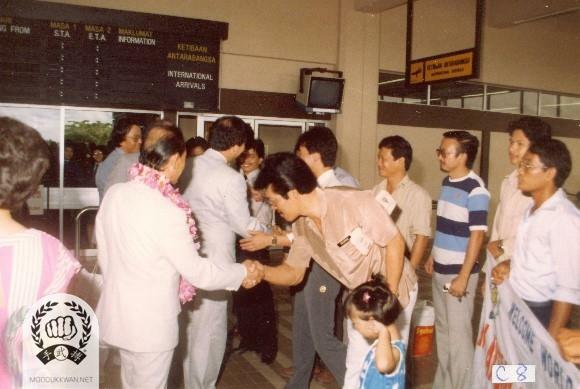 Welcoming Hwang Kee KJN. Dr. Y.Y. Lee (13418), address welcoming. 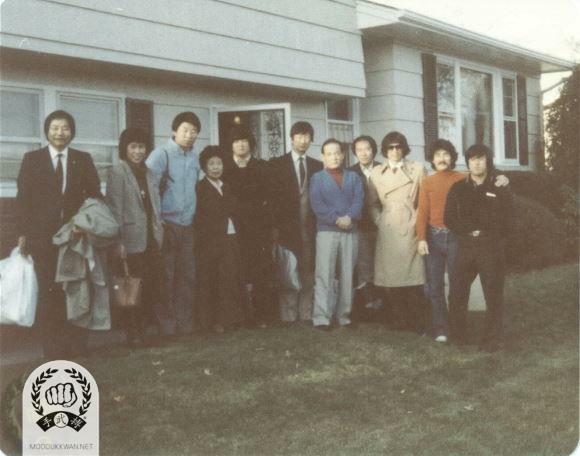 Founder and his wife's visit to branch Do Jang in New York State. 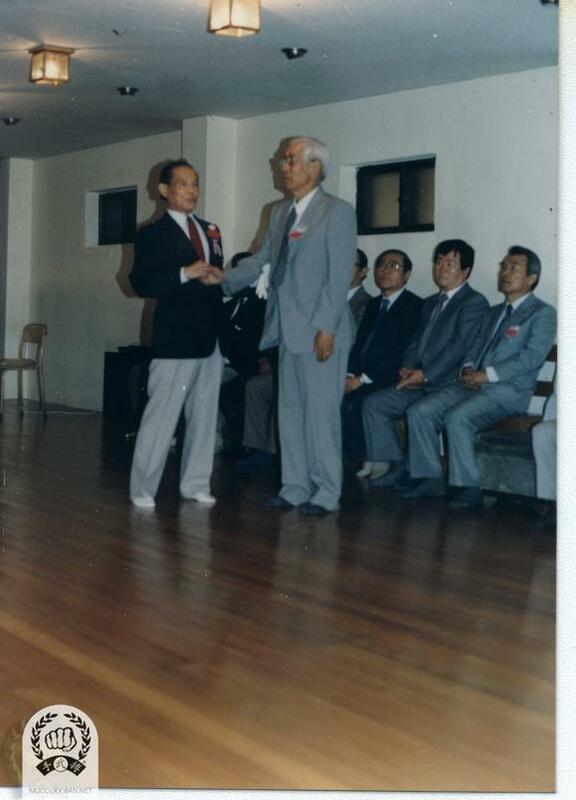 HC Hwang (509) conduct the Founder's Chil Song Sa Ro clinic on behalf of the Founder in England in 1986. The founder hand out participant's certificates after the Chil Song Sa Ro clinic in England. 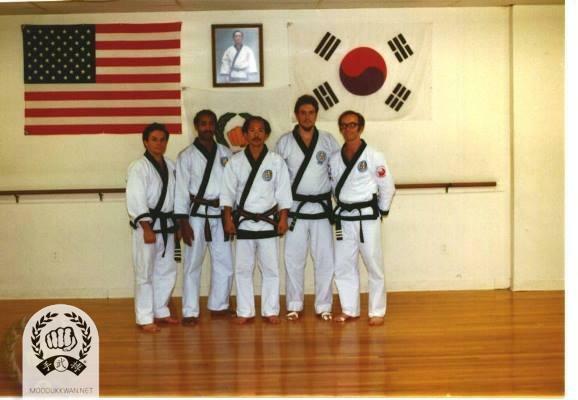 Candidates from the 3rd Ko Dan Ja Shim Sa with the founder. 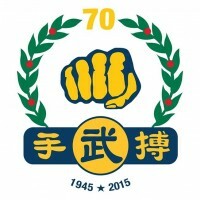 6th Dan candidates: A Ahpo(10187), V Martinov(10189). 5th Dan candidate: W Bennett, Jr.(19027). 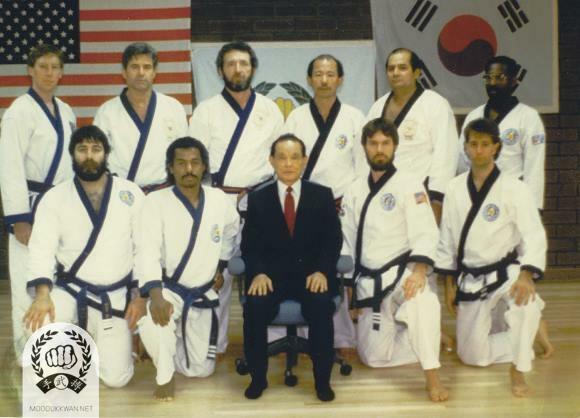 4th Dan candidates: F Schermerhorn(19787), D Southerton(19192), C Ferraro(19986), Y Seo(20564), P Bartoracci(20571). Victor Martinov (10189) during the break. Wilton Bennett, Jr. (19027) is in the background. 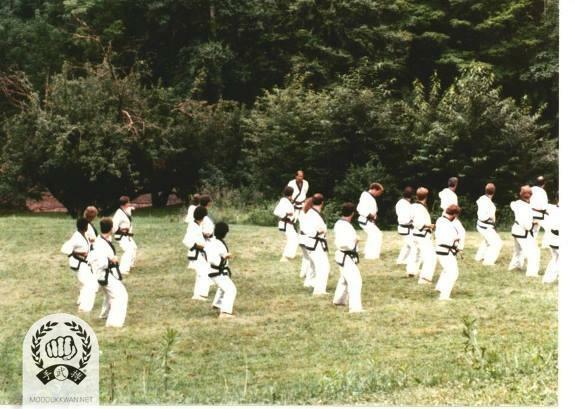 1987 July: Special International Summer Camp Training at Pathwork Center, NY. 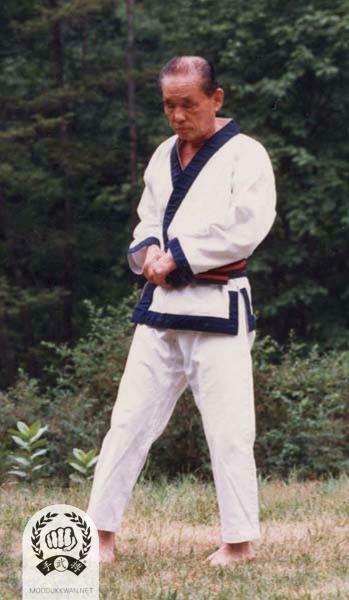 The founder at the Summer Camp at the Pathwork Center, NY in July 1987. 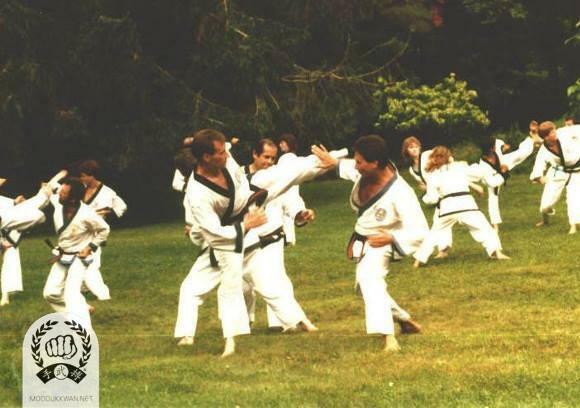 Founder is teaching at the Summer Camp at the Pathwork Center, NY in July 1987. HC Hwang (509) is assisting the founder. 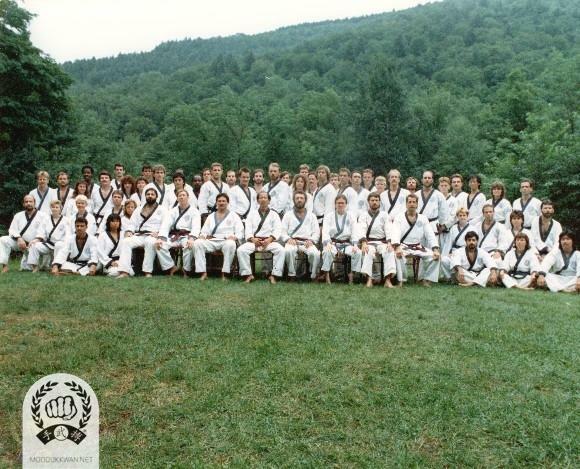 The 1987 Summer Camp at the Pathwork Center, NY. 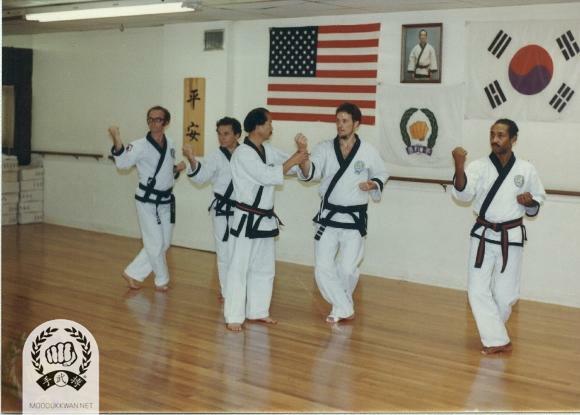 Ron Cechner (18450), Jeff Moonitz (17650), Russ Hanke (4137), Andy Ah Po (10187), Sue Robin (19459) are showing in this photo. The Summer Camp at the Pathwork Center, NY in 1987.
he 1987 Summer Camp at the Pathwork Center, NY. John Burke (21595), Vic Martinov (10189), Cluie Huffman (23705), Rick Bailey (20514), Ted Smith (22011), Sue Robin (19459), Mark Wilson (21360), Doris Beaven (19765), Lawrence Seiberlich (1815) are shown in this photo. 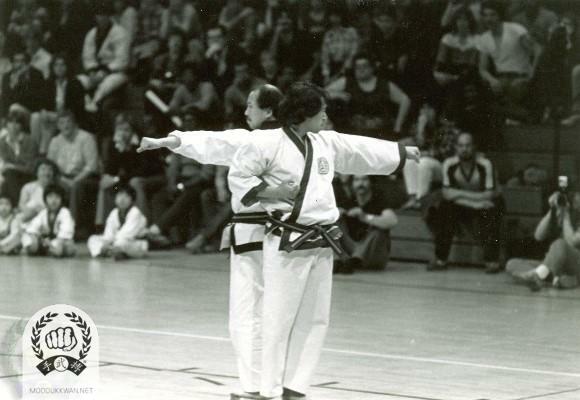 Founder and his wife at at the 8th US Nationals. 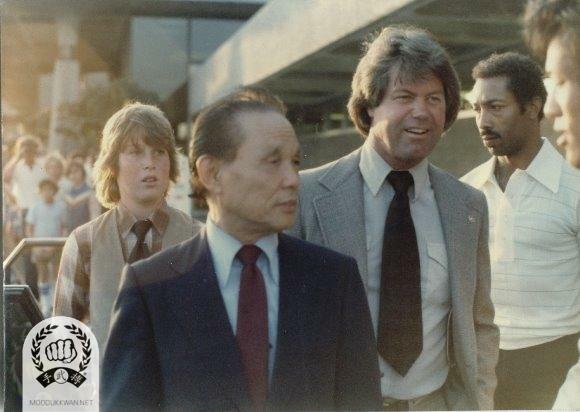 HC Hwang (509), CI Kim (475), and Ted Mason (12895) are with the Founder in this photo. 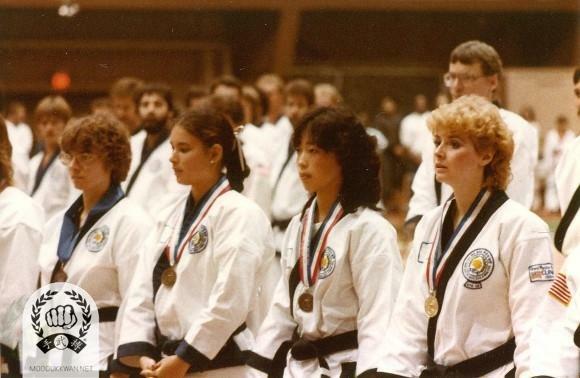 The 8th US Nationals in 1986. 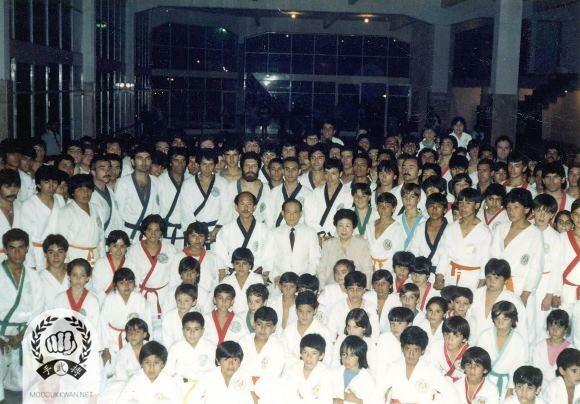 1987 December: Attended special Chil Sung Hyung Clinic for South America at Buenos Aires, Argentina. 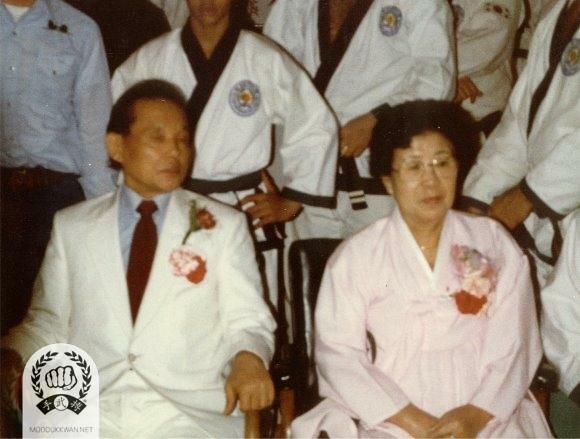 The founder's first visit to Argentina for the Chil Song Hyung clinic in Buenos Aires in December 1987. Jose Blotta (20557), Rafael Blotta (21469 ) , ? 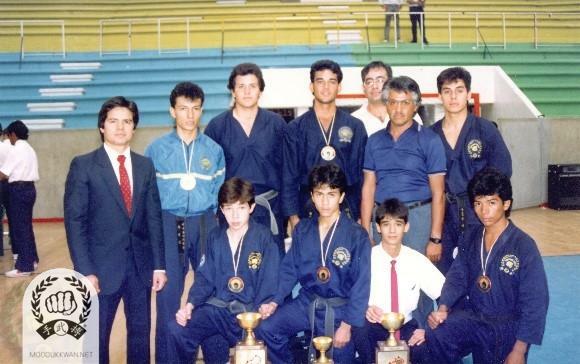 ?, Daniel Maronna (20561), Roberto Fernandez (22294), Uran , Ricardo Longinotti (22616), Raul Urquiza (22615), L are showing in this photo. 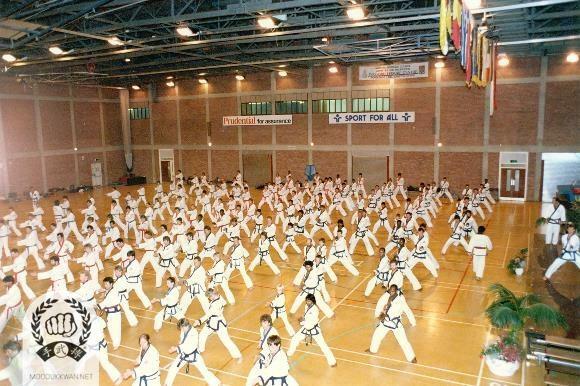 Moo Duk Kwan in Argentina during 1987. 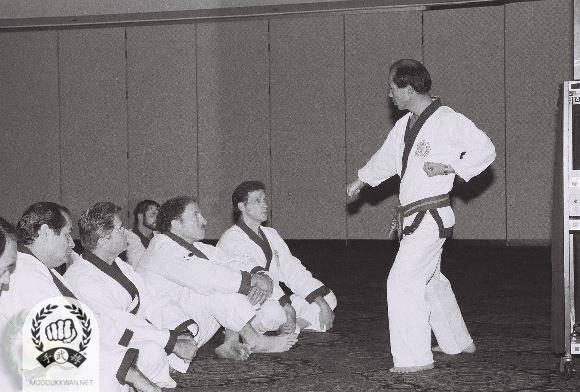 Francisco Blotta (19455) is leading outdoor class. 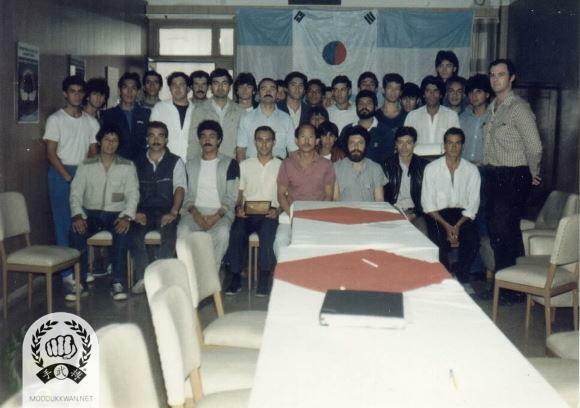 The first meeting for the Argenina National organization during the founder's first visit t in 1987. Seated from left: ? 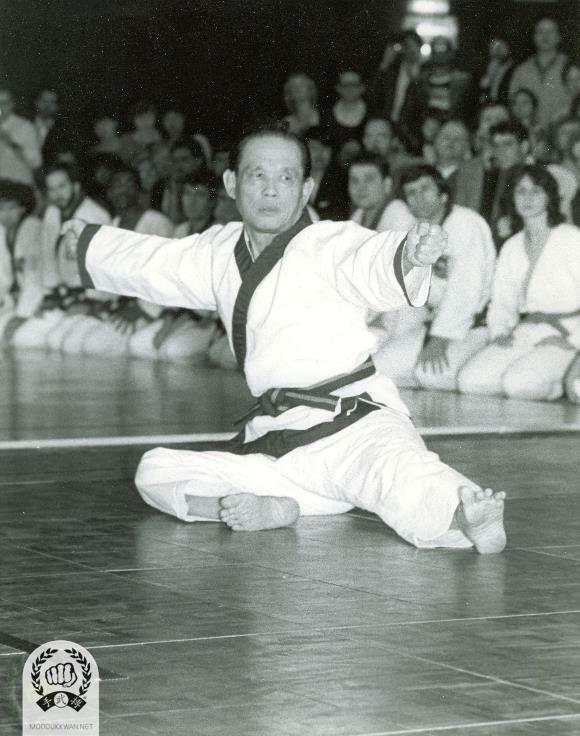 ?, Jose Blotta (20557), Rafael Blotta (21469), Francisco Blotta (19455), HC Hwang (509), Hugo Nami (22050), Roberto Fernandez (22294), Daniel Marrona (20561). 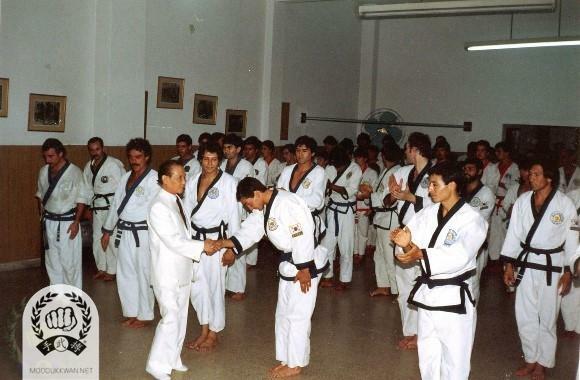 The founder's first visit to Moo Duk Kwan in Argentina in 1987. 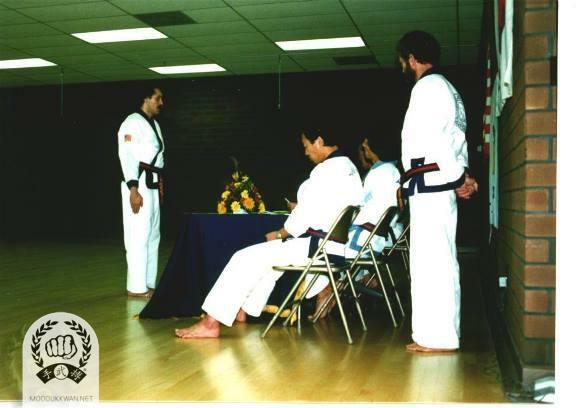 1987 USAKDJ, Frank Bonsignore (15805), Oh Dan candidates, at the oral testing at the final presentation. 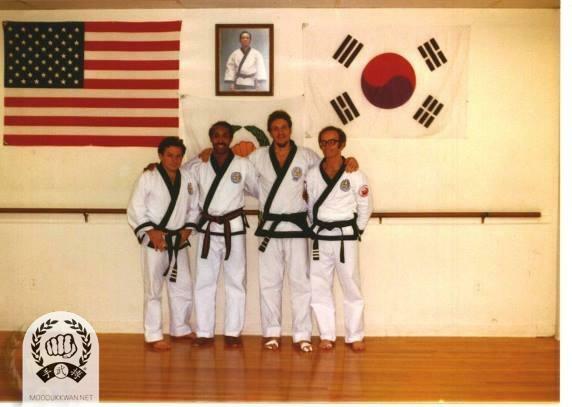 1987 USA KDJ, Sa Dan candidates from left; Fred Messersmith (20729), Brian Wilbourn (20641), Kris Poole (20632), and William Johns, Jr. (20535) at the Headquarters. 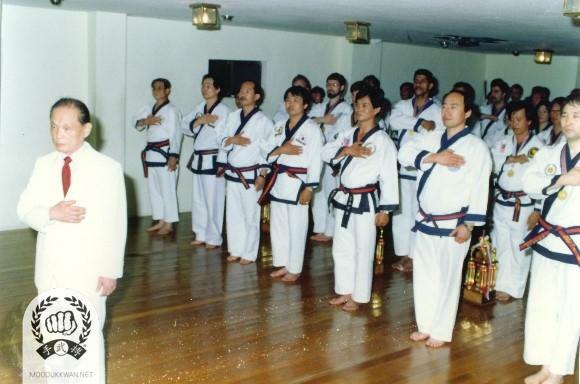 Inrtoduction of the Founder at the 1987 US Nationals in Maimi, Fl. 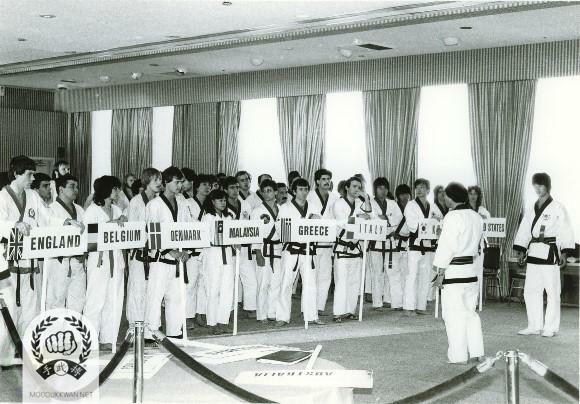 1988 March: Organized special clinic for European region at Athens, Greece. 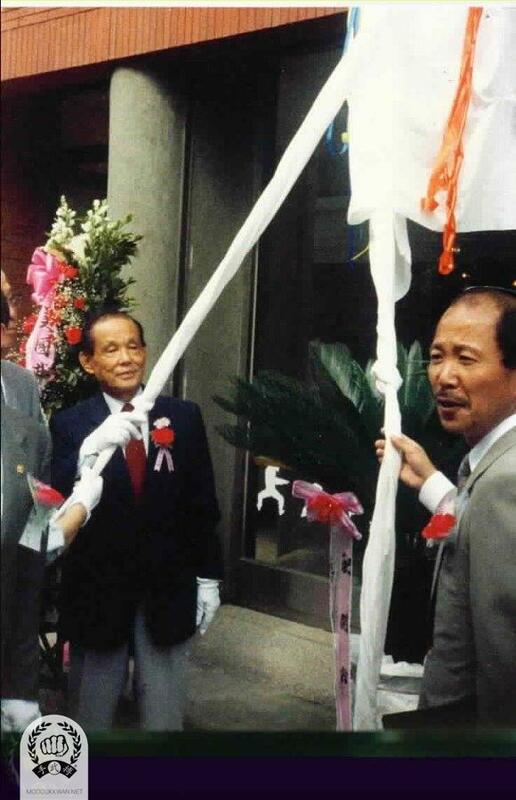 1988 May: Grand opening ceremony for new building for World Moo Duk Kwan Headquarters, Seoul, Korea. 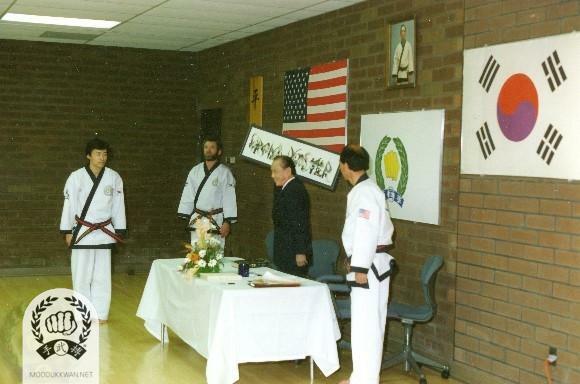 Uncovering the Moo Duk Kwan sign at the Grand Opening. 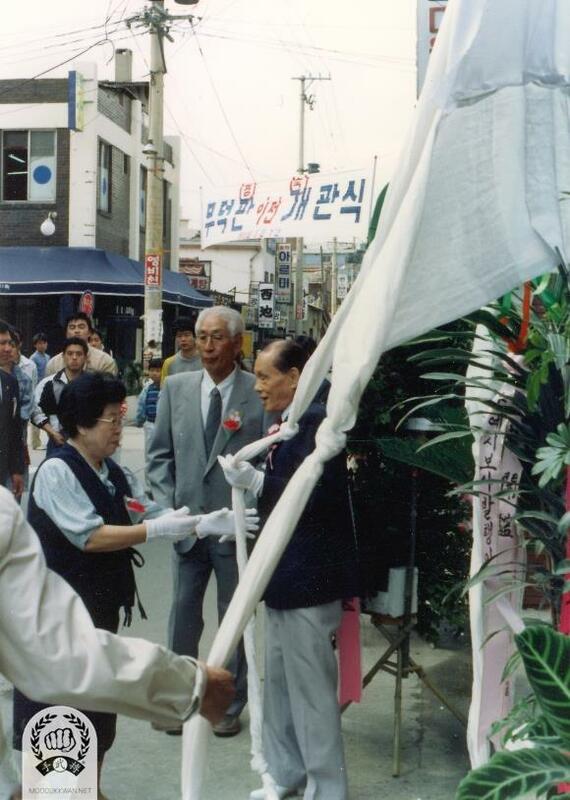 The founder introducing Professor Na, Hyun Seong to guest at the Grand Opening of the Joong Ang Do Jang in 1988.
he founder and HC Hwang (509) uncovering the Moo Duk Kwan sign at the Grand Opening ceremony for the new Joong Ang Do Jang in Yong Sa , Korea. 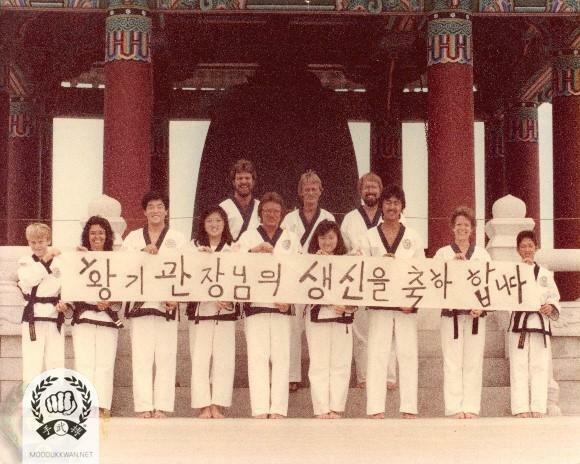 Grand Opening for the New Central Do Jang of Korean Soo Bahk Do Association, Moo Duk Kwan in Nam Young Dong, Yong San Ku, Seoul in May 1988. The founder is meeting with Professor Na, Hyun Seong who introduced Moo Yei Do Bo Tong Ji to the Founder for the first time. 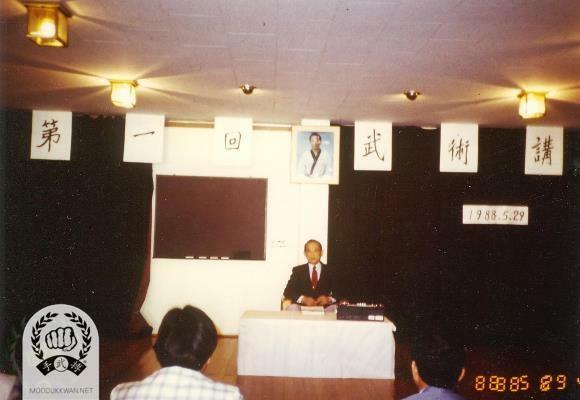 The founder holding the Moo Do lecture at the Joong Ang Do Jang on May 29, 1988. 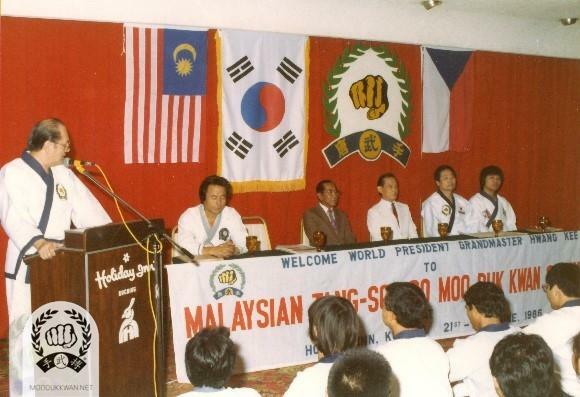 1988: Special clinic and Ko Dan Ja meeting for Southeast Asia region at Kuala Lumpur, Malaysia. 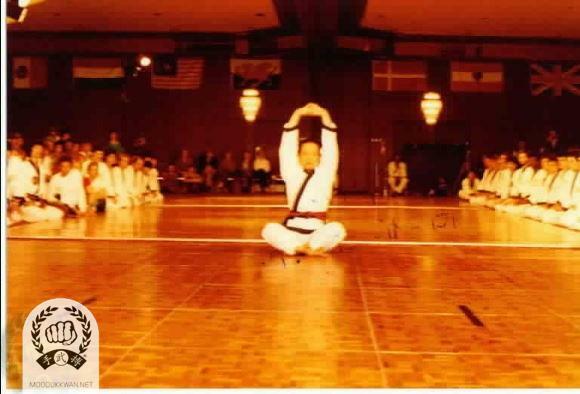 1988 November: Attended Tenth United States Tang Soo Do Moo Duk Kwan Championship at West Point. 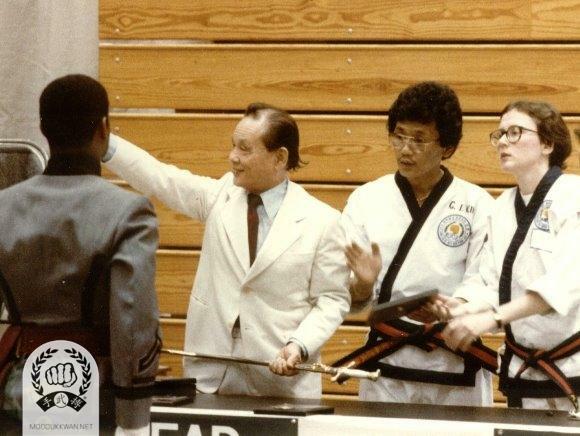 The founder and Mrs. Hwang Kee at the 1988 US Nationals in the West Point, New York, USA. 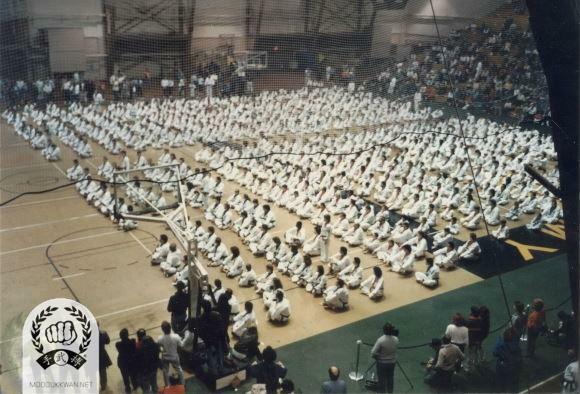 The 1988 US Nationals at the West Point, New York. 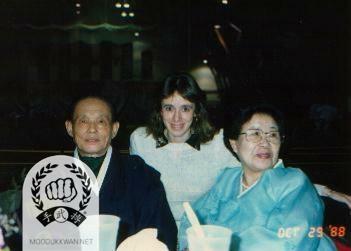 Pilar Leguel (22013)'s visit the Founder and Mrs. Hwang Kee in New Jersey, USA. 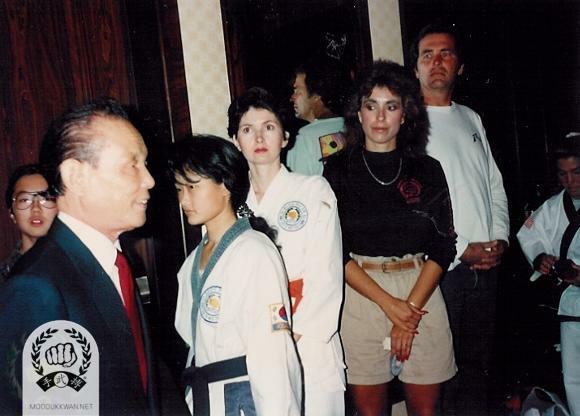 The founder and his wife at the 1988 US Nationals at the West Point, New York. 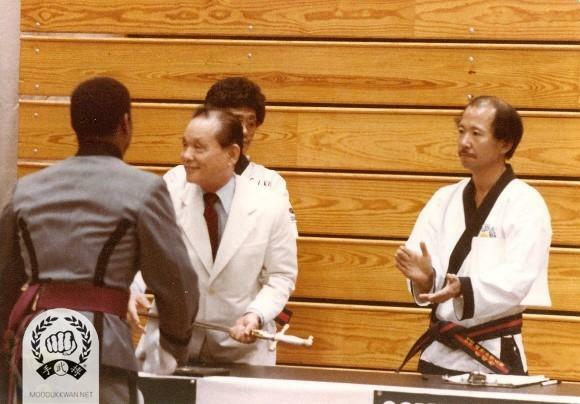 The founder receives a sword from a cadet at the West Point. CI Kim (475) and Mary Ann Walsh (17926) are next to the founder. 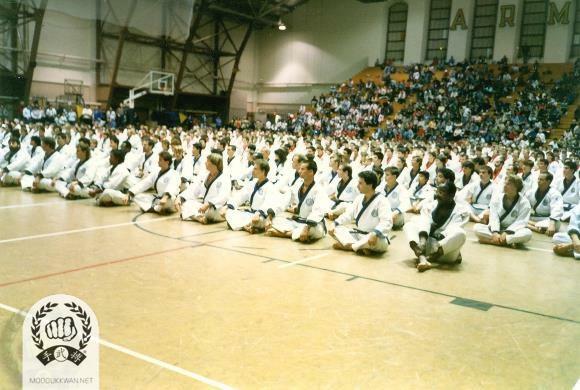 The begining ceremony for the 1988 US Nationals in West Point, New York, USA. 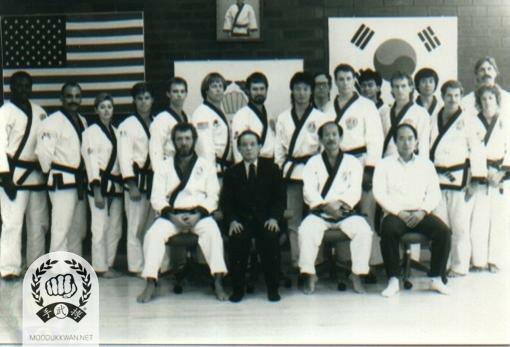 1988 December: Sponsored and organized World Ko Dan Ja special training in Seoul, Korea. 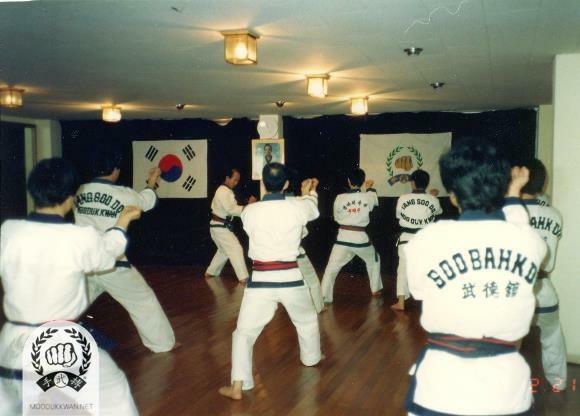 HC Hwang (509)'s Chil Song Hyung Clinic at the Joong Ang Do Jang in Korea during 1988. 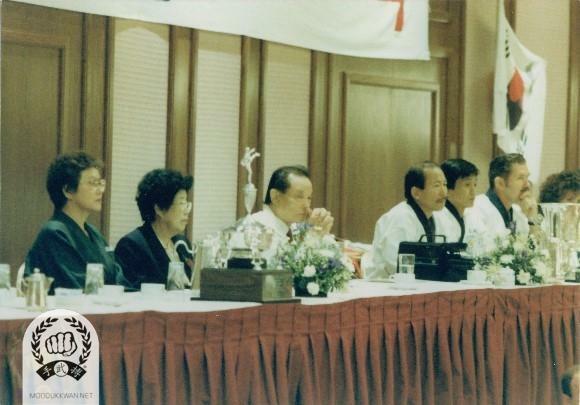 1989 January: Attended Ko Dan Ja meeting and initiates discussion of “Mission 2000” agenda. 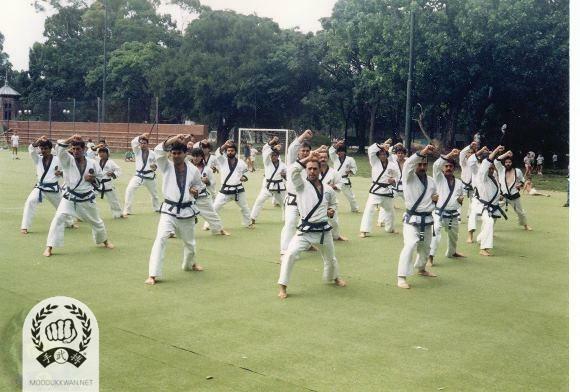 1989 National Summer Camp in New York. 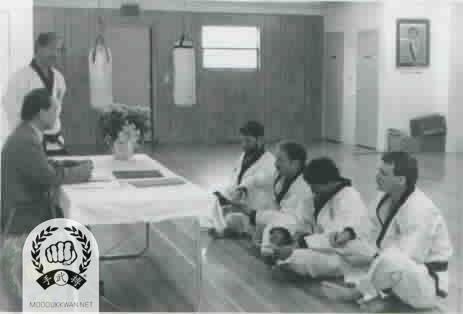 Seated from left to right; Charles Ferraro (20629), Donald Southerton (19192), Jeff Mooniz (17650). 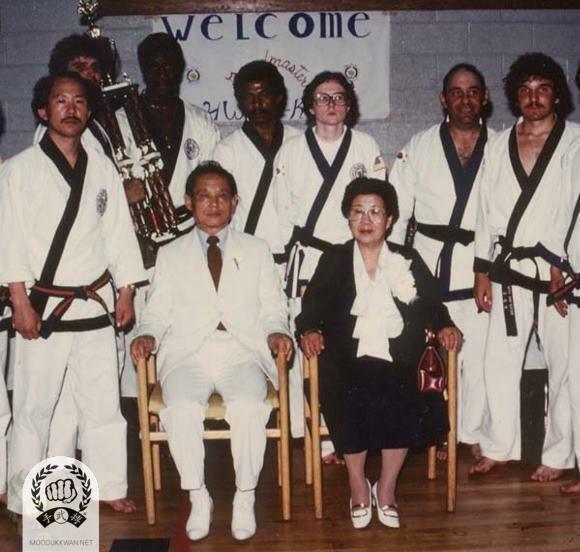 H.C. Hwang (509), Russ Hanke (4137), Mary Ann Walsh (17926), Frank Schermerhorn (19787), Phillip Bartolacci (20571). 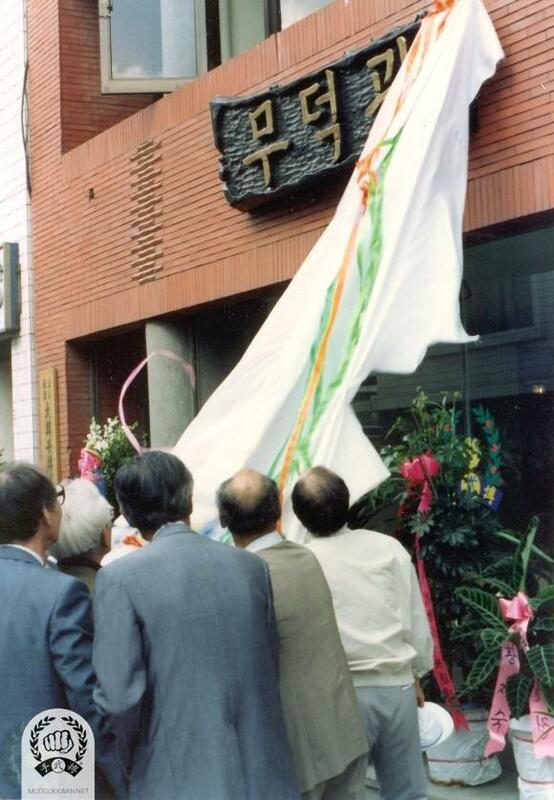 1989 March: Opening of new Headquarters for the Korean Soo Bahk Do Association, Seoul, Korea. 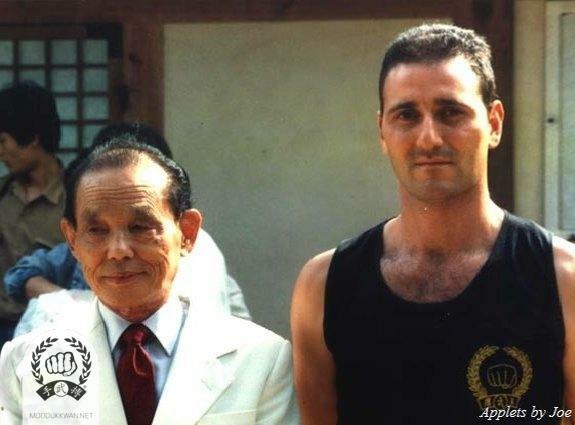 The Founder with Gianni Anile SBN of Italy (21328) at the Folk Village in Yong In, Korea. Lotte Hotel in Seoul, Korea. 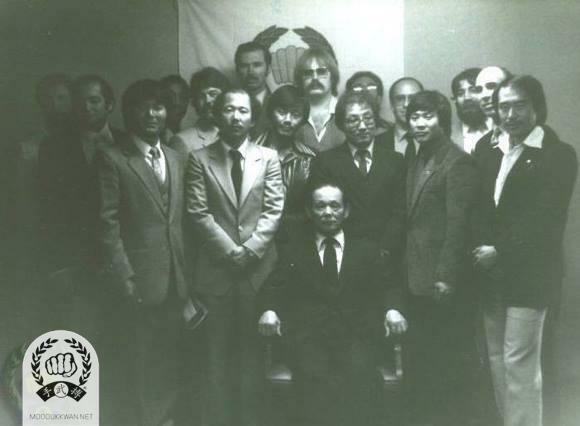 The Founder with Senior members and guests at MDK Headquarters in Korea. 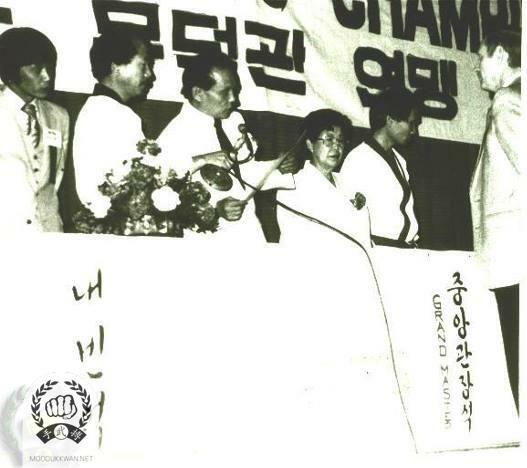 From left; Choi Hee Seok (5), Lee Kang Uk (70), H.C. Hwang (509), Kim Seong Gi (539), Pak Man Seok (8037), Hong Yong Gi (4142), Kim Du Ryeol (5998). 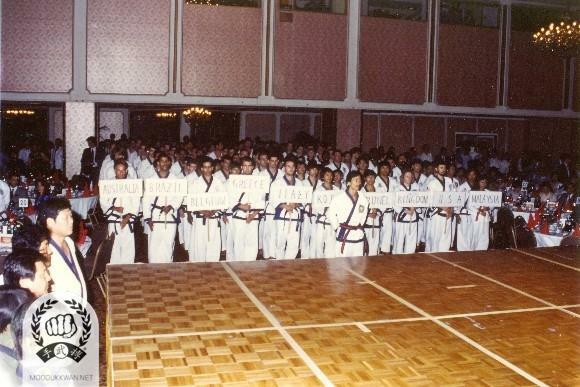 National Teams at the 1989 International Demonstrations at the Lotte Hotel in Seoul, Korea. 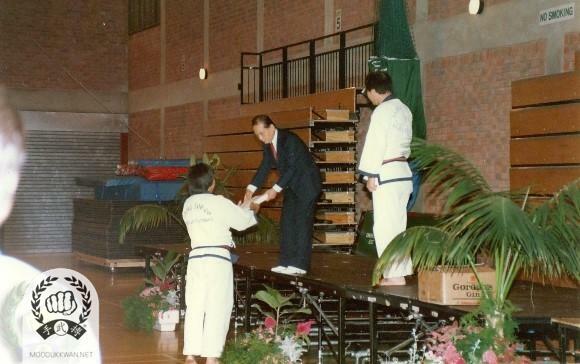 The Founder receiving a gift from the American team at the 1989 International Demonstrations in Korea. Daymon Kenyon (19839) & Frank Schermerhorn (19787). 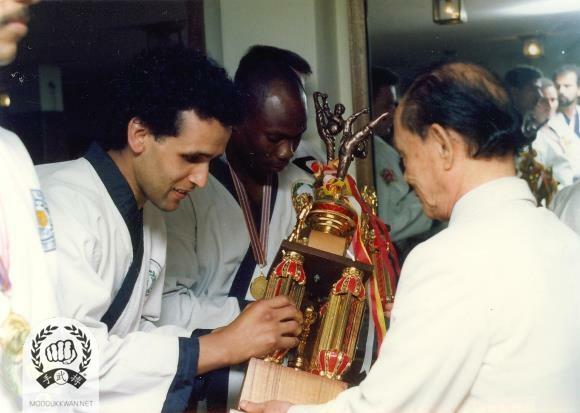 The Founder with Hassan el Bousaalaa (21015) of Belgium. 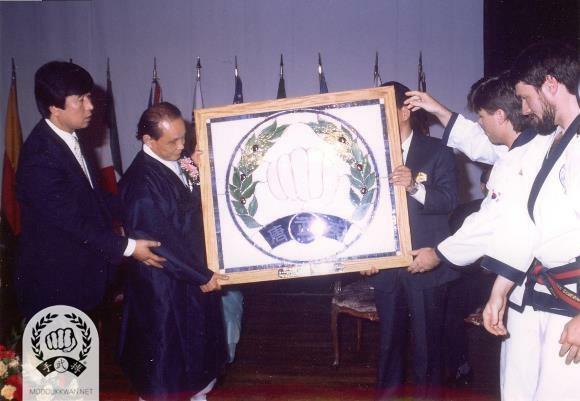 The Founder receiving a gift from Udan Menon (21662) of Malaysia. The Founder’s entrance followed by Choi Hee Seok (5), Park Sang Tcheon (48), Anastasios Metaxas (20680). Yeon Seo (20564), Phil Duncan (20631), Kris Poole (20632), Daymon Kenyon (19839) with the Founder. 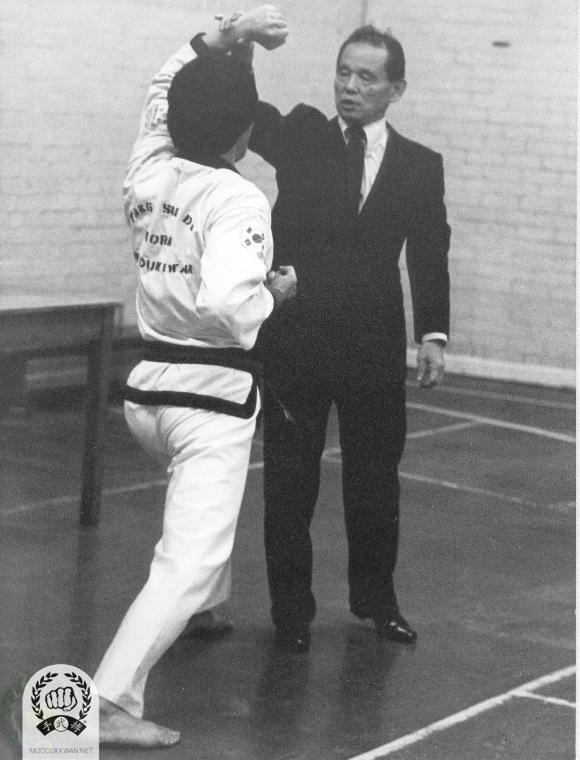 Demonstration by Hong Yong Gi (4142), H.C. Hwang (509), Hong In Ki (16541). 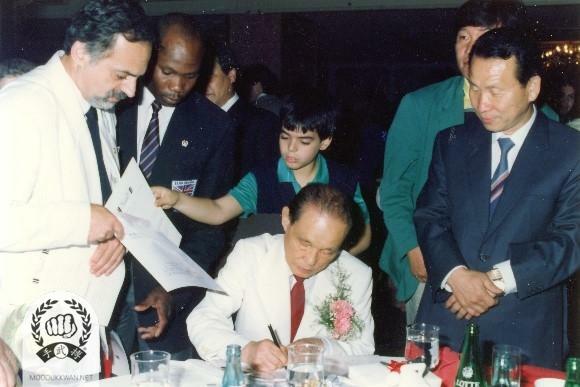 The Founder signs an autograph for John Polychroniou (20681) and Park Sang Tcheon (48) standing at the far right. 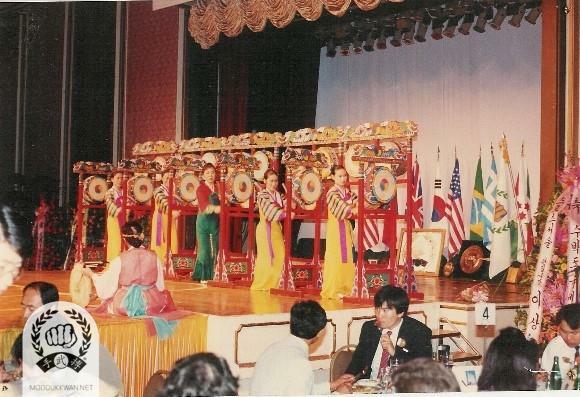 Korean drum dance musicians at the International Demonstration banquet. 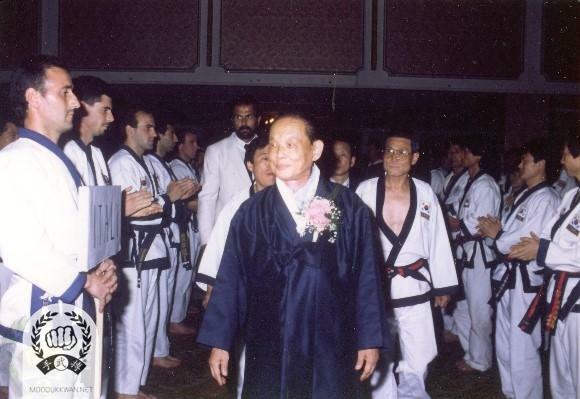 1989 Ko Dan Ja Shim Sa: Founder attends the KDJ Shim Sa in Springfield, NJ at Headquarters Do Jang. 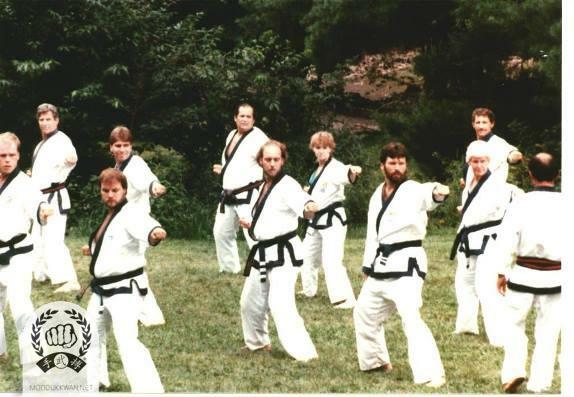 Standing left to right; Russell Colston (22358), William Ginyard (19960), Lois Roccado (20570), Ben Cortese (11689), Paul Barton (17409), Lloyd Francis (12924), Fred Messersmith (20729), Jeff Moonitz (17650), James Donnelly (14436), Bill Diaz (20603), William Johns (20535), Hong In Ki (16541), Sandra Russell (21351), John Johnson (20510), Marlene Kachevas (20786). 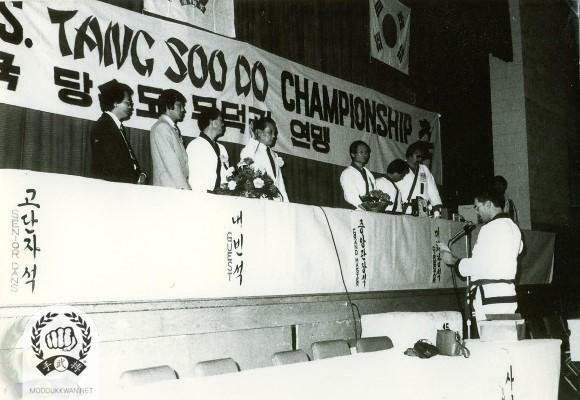 Seated in Chairs; Hong Yong Gi (9193), Russell Hanke (4137), The Founder, H.C. Hwang (509). Seated on floor; Thomas Reyes (21956), Steve Propst (20636), Linda Morey (20742), Bill Nelson (21420), Thomas Lux (21944), Ken McNeel (21383). 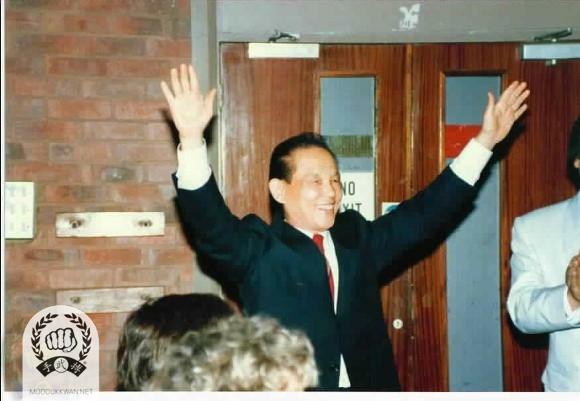 “Il So Il So Il Ro Il Ro” at the 1989 Ko Dan Ja. 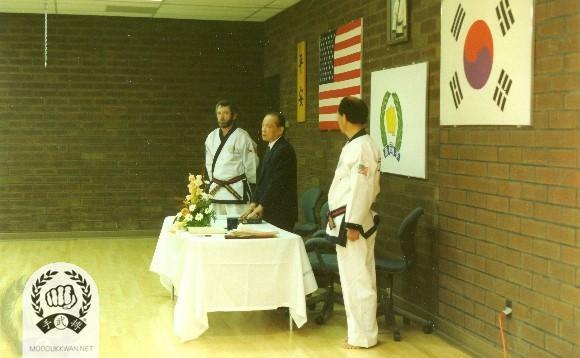 William Ginyard (19960) with the Founder, Russ Hanke(4137), H.C. Hwang (509). Hong In Ki (16541), Russ Hanke (4137), The Founder, H.C. Hwang (509). 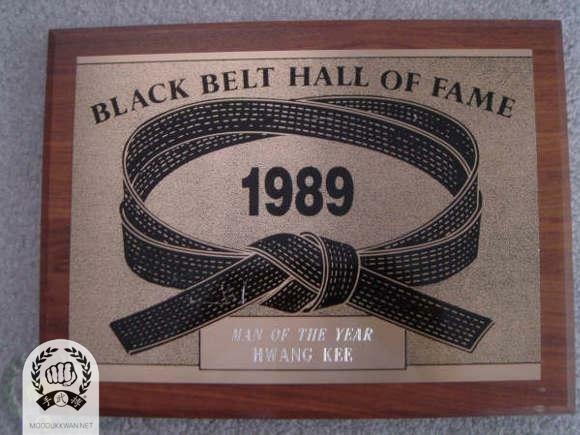 1989: Black Belt Magazines “Man of the Year”.